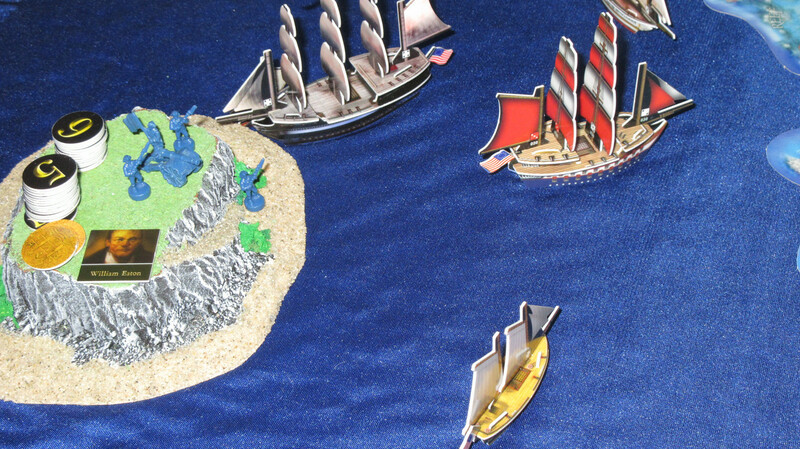 I should have noted in the previous report that some Command the Oceans content will be released earlier than these battle reports. If you want to hear about things as soon as you can, make sure to follow me on Instagram and subscribe to my youtube channel. There will also be some content exclusive to those apps. I was able to play 6 turns today! 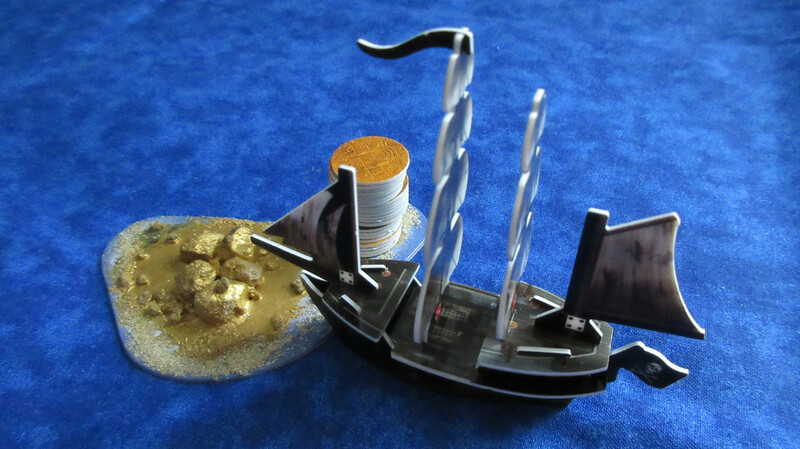 The Crusher has already loaded a coin from the gold island… when a mysterious new ship appears!! And just like that, the ship disappears! 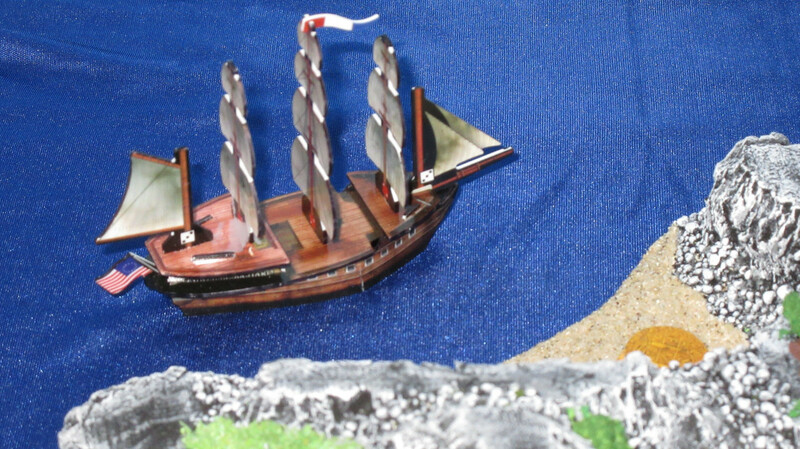 Mission and his crew are left awed but confused by the near encounter with the strange ship. 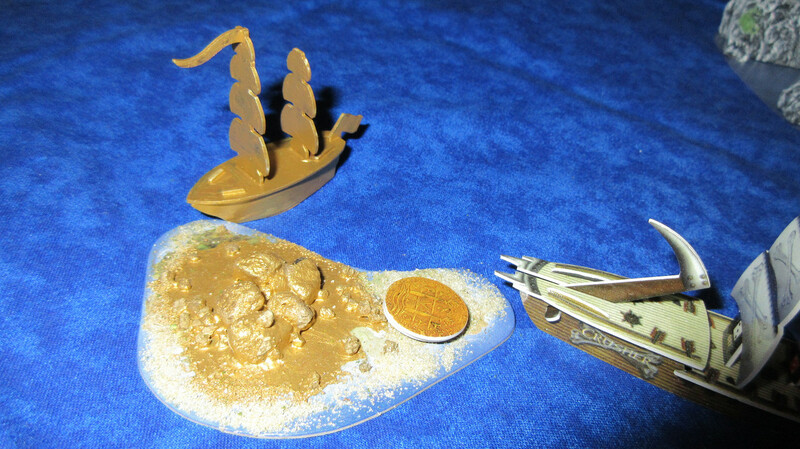 However, they soon discover that the gold-laden island is brimming with new treasure!! 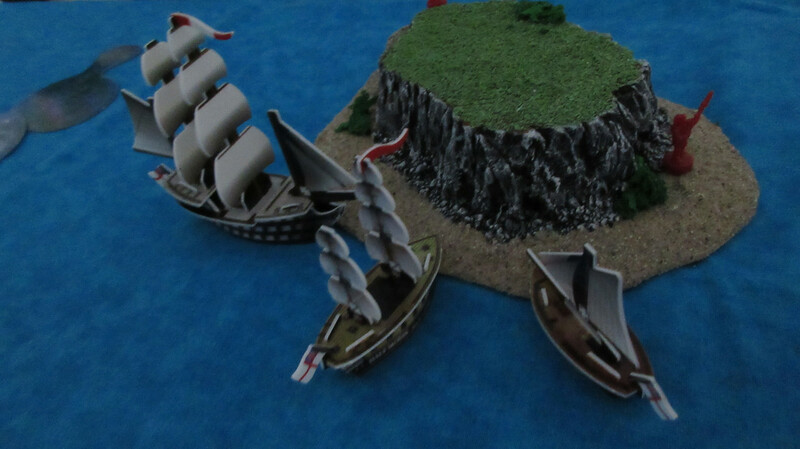 Worried about the Sea Serpent, who seems to have disappeared without a trace, the Jade Rebels follow orders from Warlord Cavendish and send a squadron of three ships in the direction the Serpent went on her exploratory assignment. The English hire the Lady Provost with converted textiles from the Durham, and plan to pick up the ladder equipment with the Viceroy. 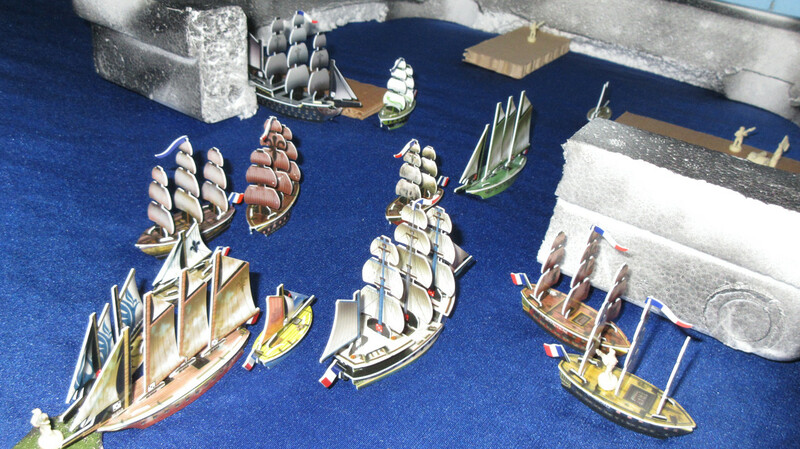 The French spend some gold to launch the Glaive and Le Musarde, in addition to buying some army units. The American resource system, which is in full swing. 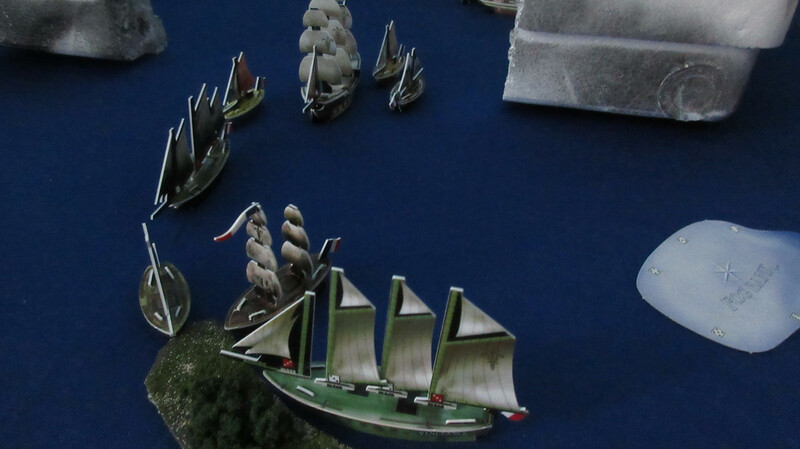 At the far right, the Minuteman is finding yet more reefs and consults with Preble on the President. 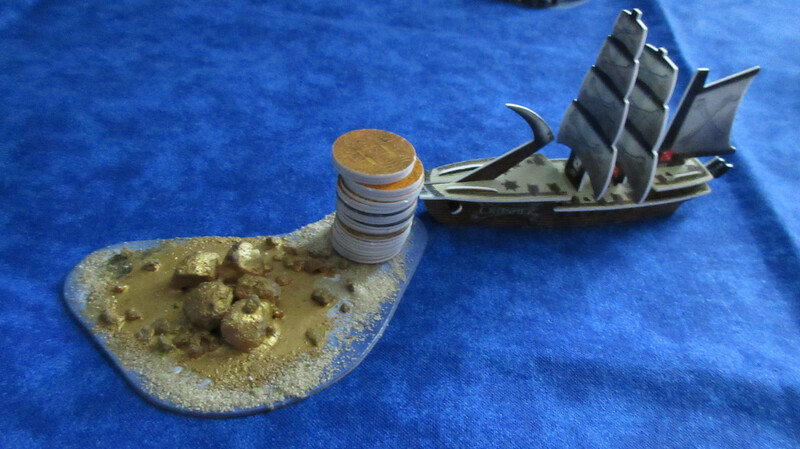 The Pirates have valuable metals come in and go on a spending spree. 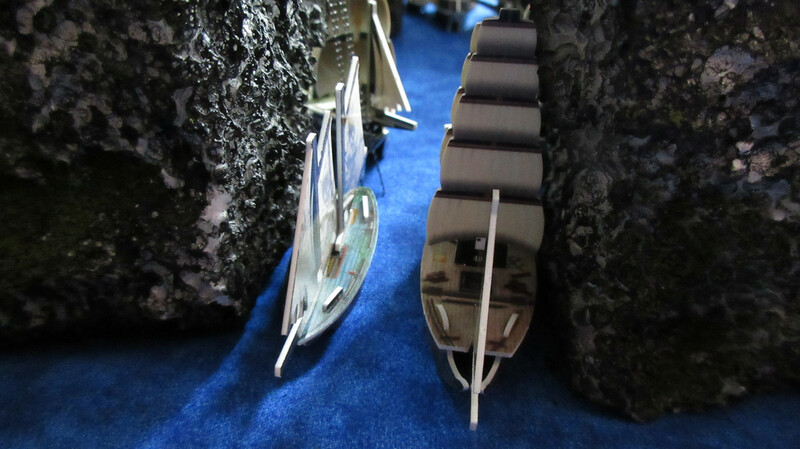 They opt for some ships with extremely large cargo holds – the Darkhawk II and the Pandora. The Otter and Mermaid are also launched. 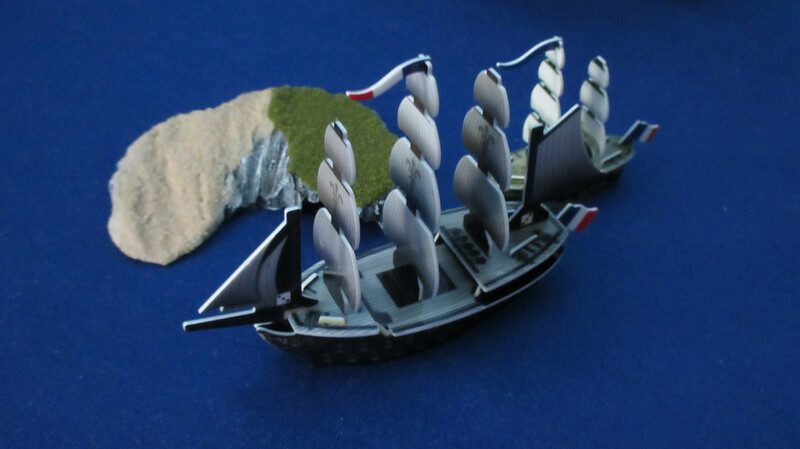 Notice that the Pirate army units are now gray, as I had them mixed up earlier. The Jade Rebellion will have the green units. 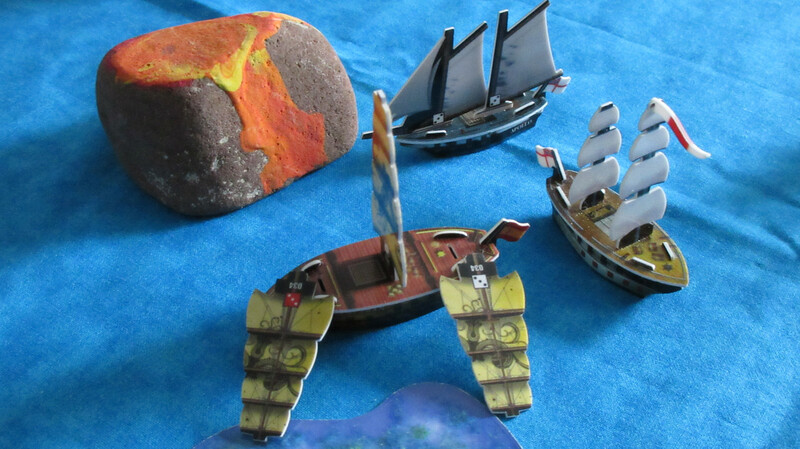 The excited crew aboard the Crusher can’t wait to tell their fellow pirates about what they saw and the vast treasure in store for them at the golden island. 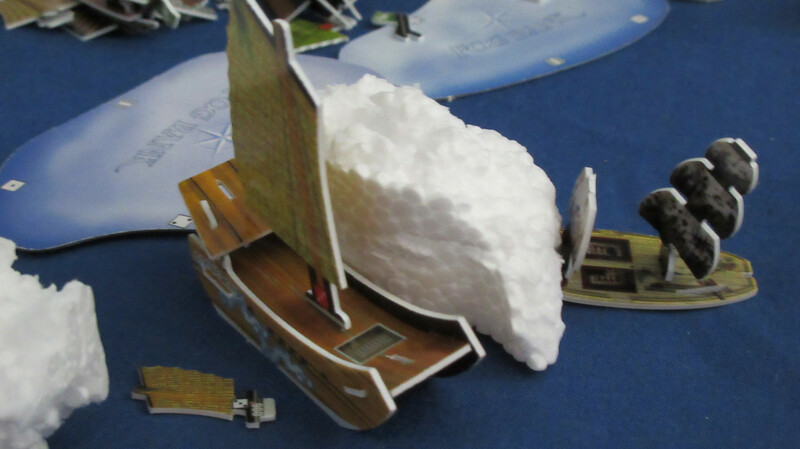 Making good speed towards the west, the Divine Wind, Admiral Yi, and Hansan Island sail past the icewrecks. The bergs don’t move at all. 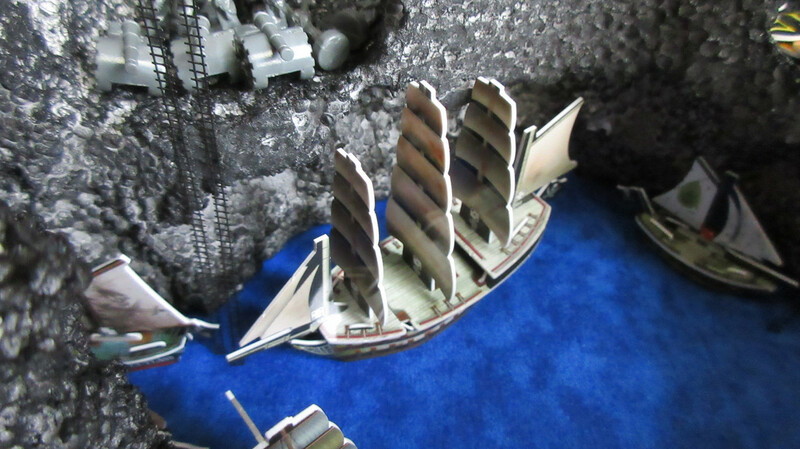 With a large influx of gold due to somewhat valuable textiles, the Jade Rebellion is too overwhelmed to spend it all! 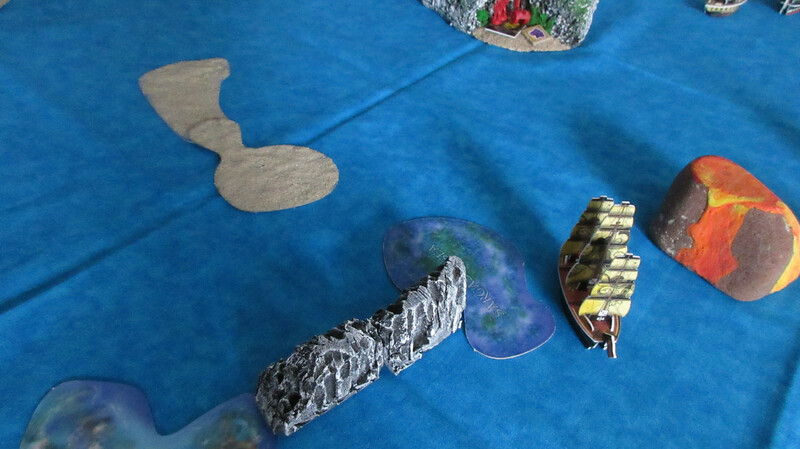 However, two new turtle ships enter the game: the Dragon’s Talon and Proud Tortoise. 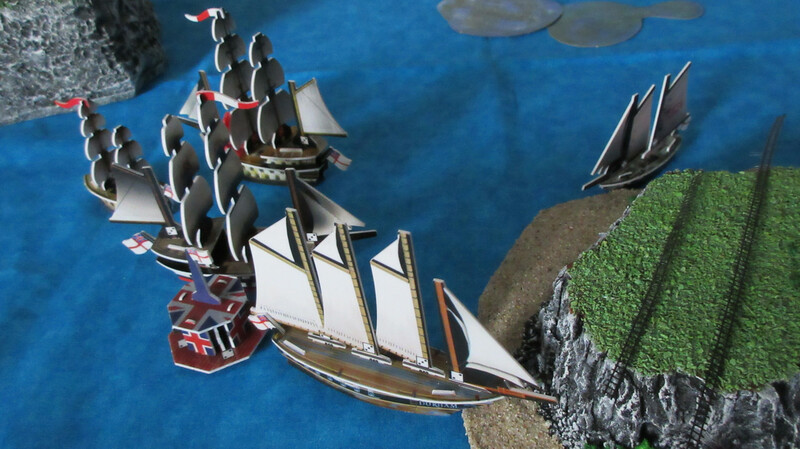 The first shots of the game have been fired in the Caribbean! 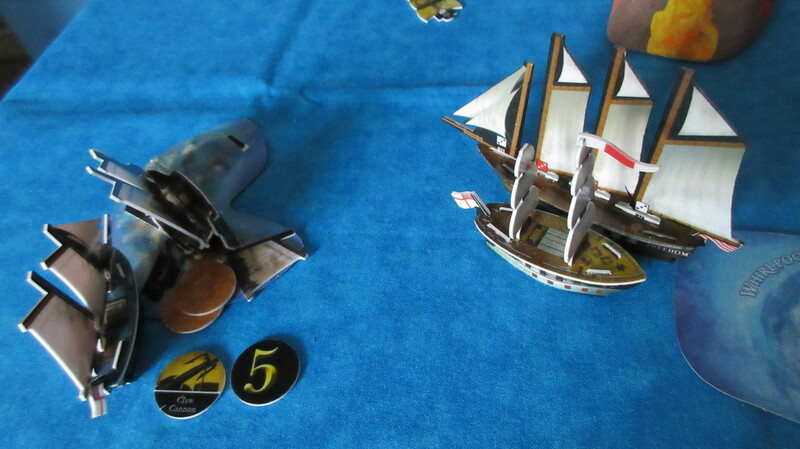 The Apollo comes over to assist the King John if she needs it, but doesn’t have a captain aboard. 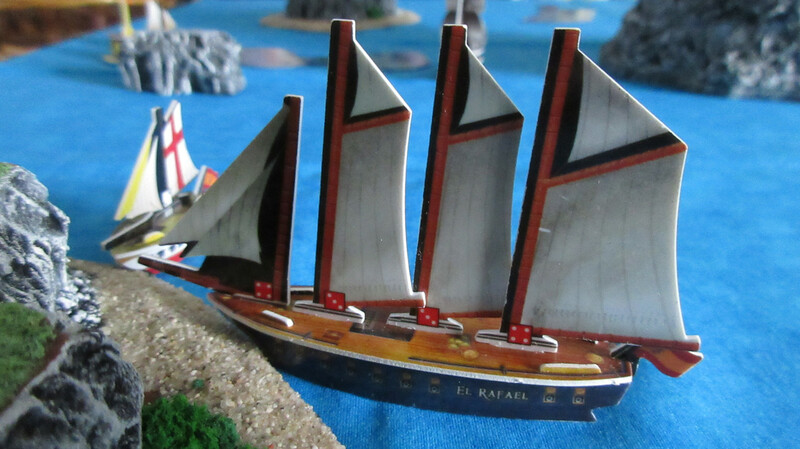 The Spanish back home aren’t yet aware of the newly hostile English, and launch El Rafael with a helmsman to gather resources and/or gold. She’s an underrated ship capable of playing an under-the-radar hybrid game. Back in Karkuda, the Freedom is launched by the Americans! 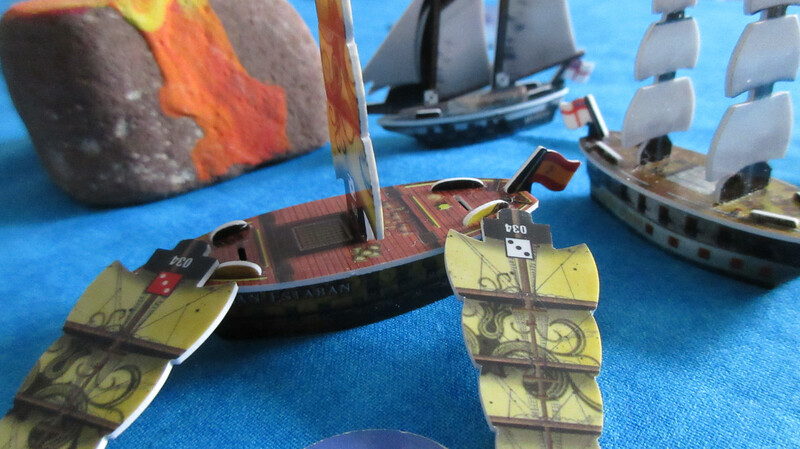 She is crewed with pirate hater Ralph David, a captain, helmsman, and cannoneer. RD immediately begins asking if anyone has seen any pirates lately. 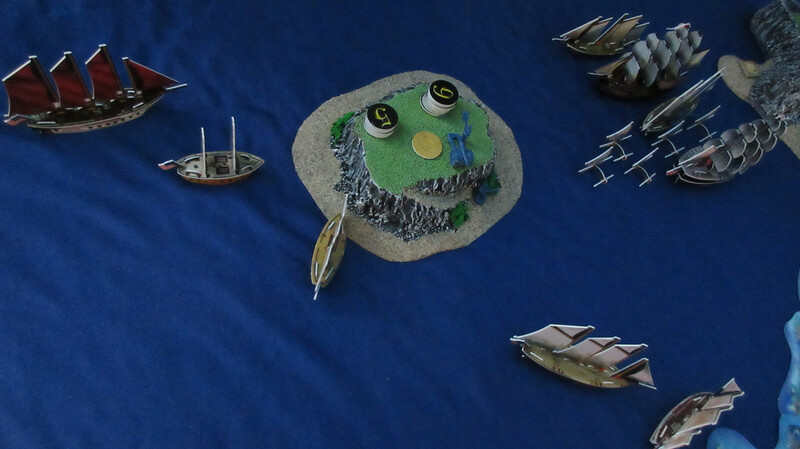 He seems to be extremely angry about something and orders his crew to get ready to sail with all speed. “Time to hunt a pirate”. 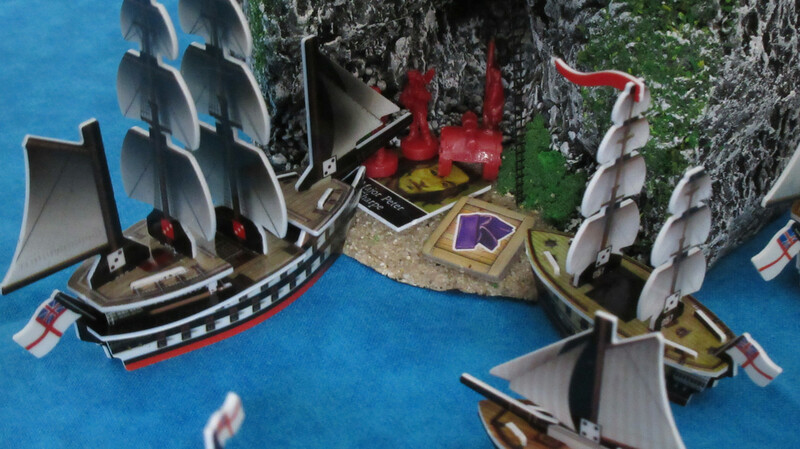 Speaking of Pirates, check out this exodus from Mission’s Kingdom. 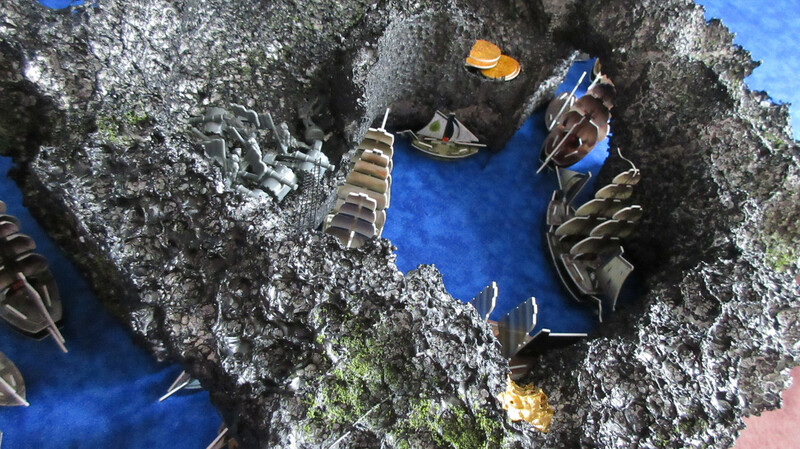 Not all the ships can get out at once, which is one of the weaknesses of having such a strong defensive haven – getting inside is nearly impossible for invaders, but the small entrances make leaving the hideout very difficult after a bunch of ships are launched! 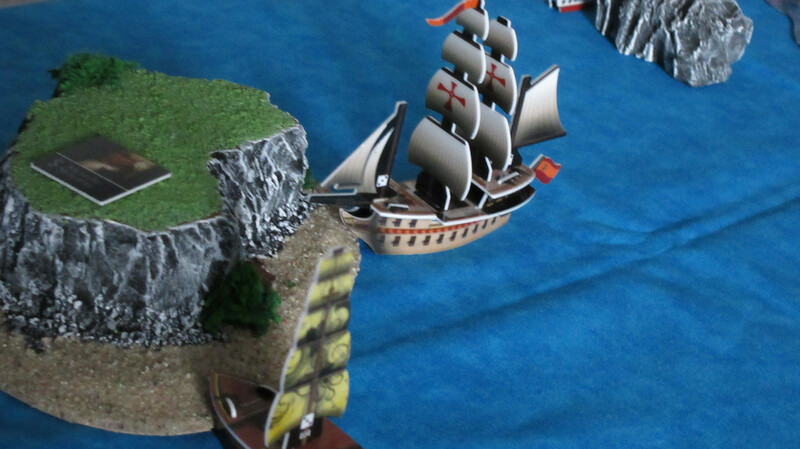 With the damaged San Estaban predictably fleeing the scene, the English turn around to check out why the Spanish were in the deep south of the Caribbean in the first place. The crew of the Apollo show the crew of the King John the Duke shipwreck, and discuss whether or not they should try to land near the reef. 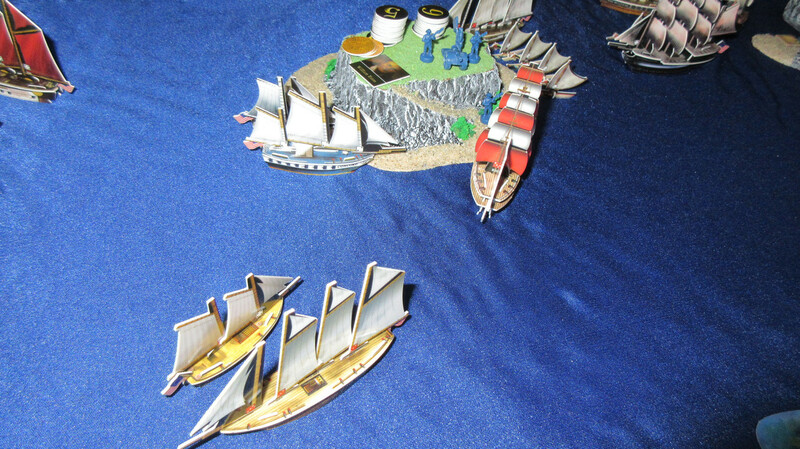 The Lady Provost picks up resources for the first time, while the Burma and Viceroy return to the scene of their recent miscue. A wider shot of the Caribbean, as I will admit that you have now seen pretty much the entire Caribbean. A spending spree by the French! 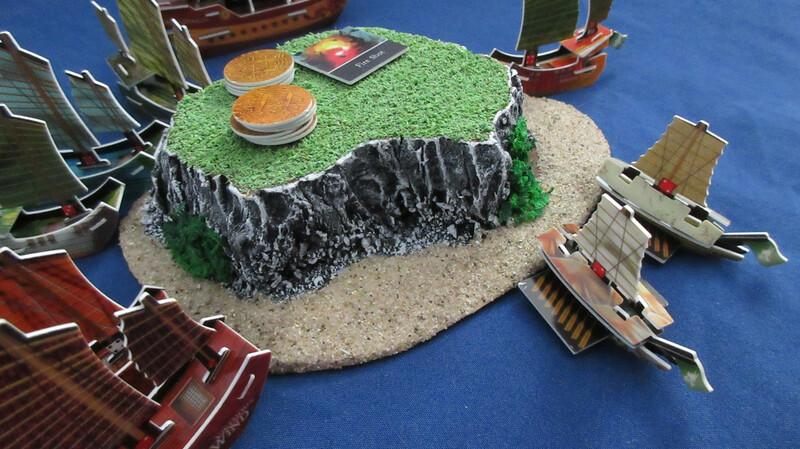 From 60 gold they purchase two new docks for their Harbor, in addition to a trio of 3 masters from Crimson Coast. 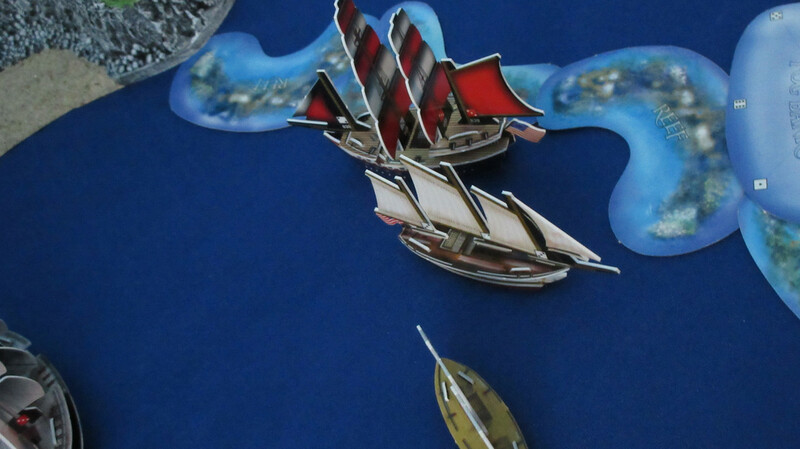 As more ships are launched, the Harbor is becoming more and more useful. The French resource system is working great, but they’re still not satisfied! 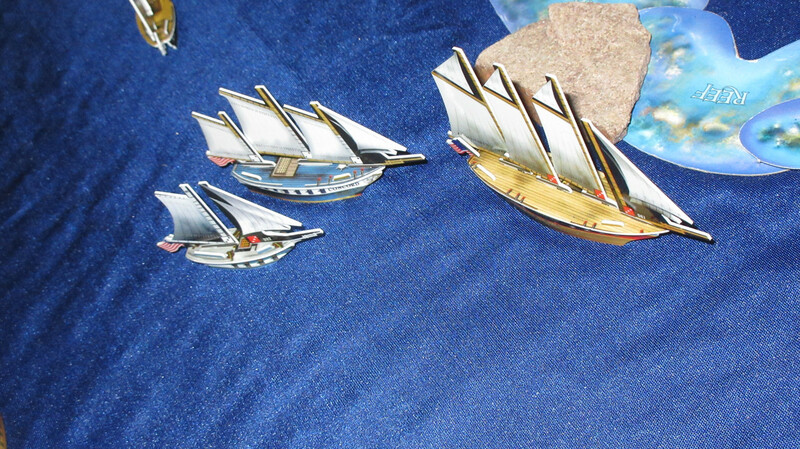 Ships coming and going, new docks being built, ships being launched – it’s a busy scene at the Harbor! 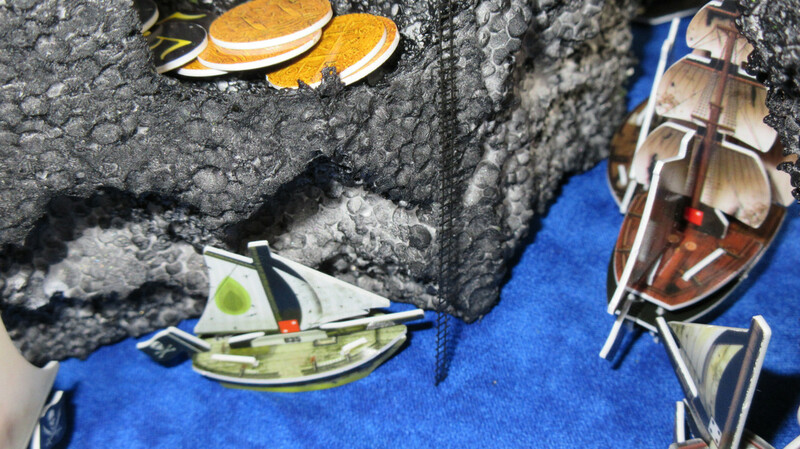 The crew of the Wasp are disappointed to find that the luxuries found on Ruby Island have run out! This is a setback for the Americans, and proves that some islands may not simply produce the same resource to infinity. In a fittingly dark picture, the Freedom makes all sail towards the whirlpool with a brooding Ralph David at the helm. Perhaps she will be the first ship to try a whirlpool? 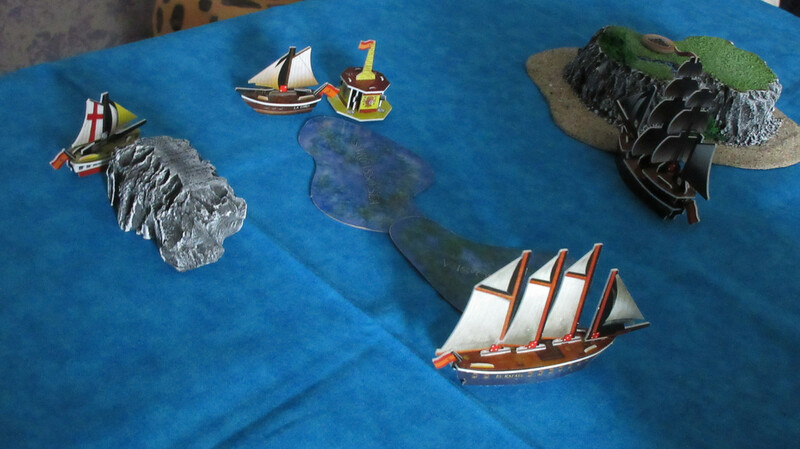 In the shimmering waters of Karkuda, the Minuteman’s crew find yet MORE reefs. 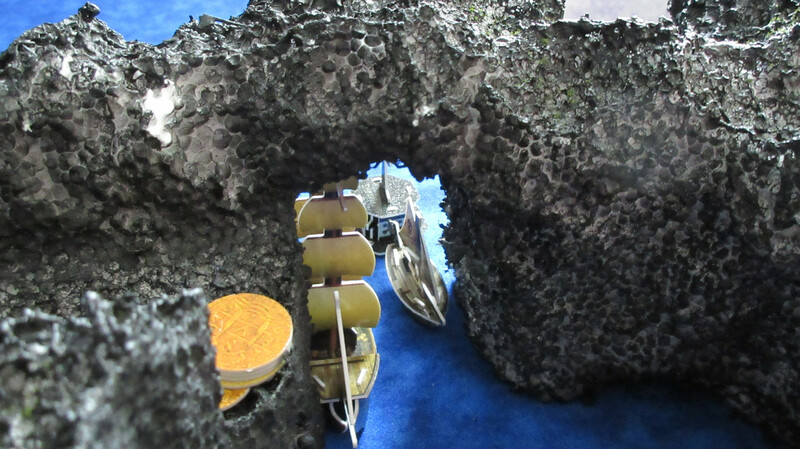 It seems as though their area is boxed in by the terrain, which could pose a problem for them…. 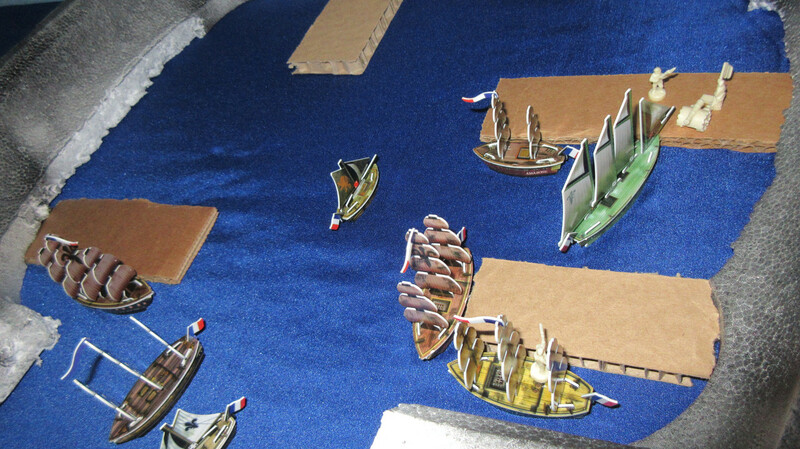 Similar to the French, the Americans are sending lots of cargo ships to the valuable food area. 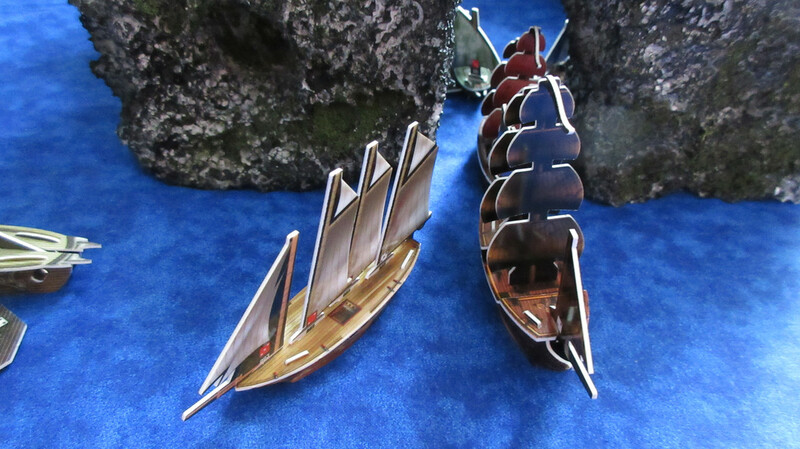 The Cassandra is the first ship to return to the golden island after the “gold ship” visited! 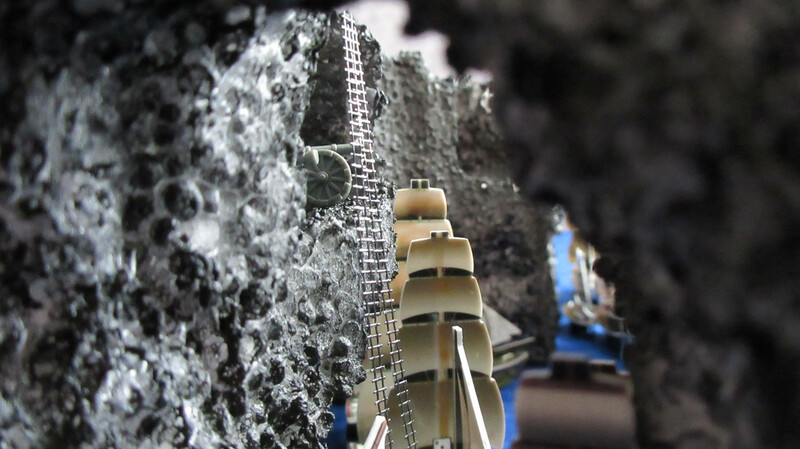 Mission told Gunner about the immense riches, and Gunner replied that he would surely sail straight there. 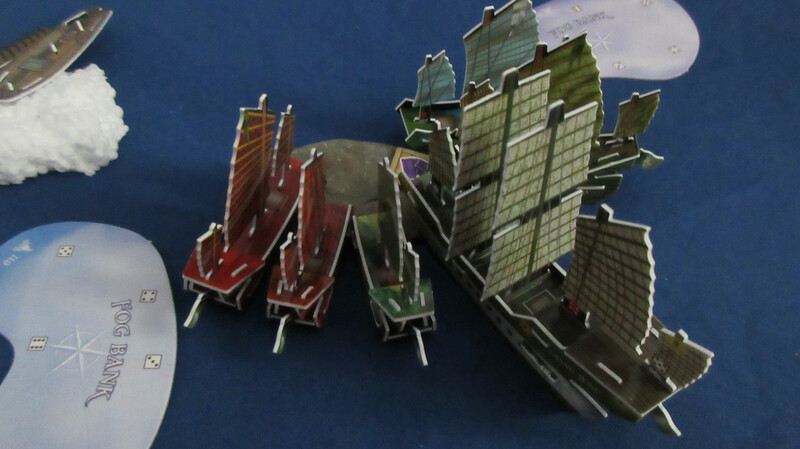 -I will be using the same “shiny” rules as I did for my Economy Edition game from 2015, which means shiny silver is worth 3 times its printed value and shiny gold is worth 2 times its printed value. -You can’t really tell from this picture, but that 6 on the left is actually a “ghost coin” from the DJC SR UT card (The Cursed). 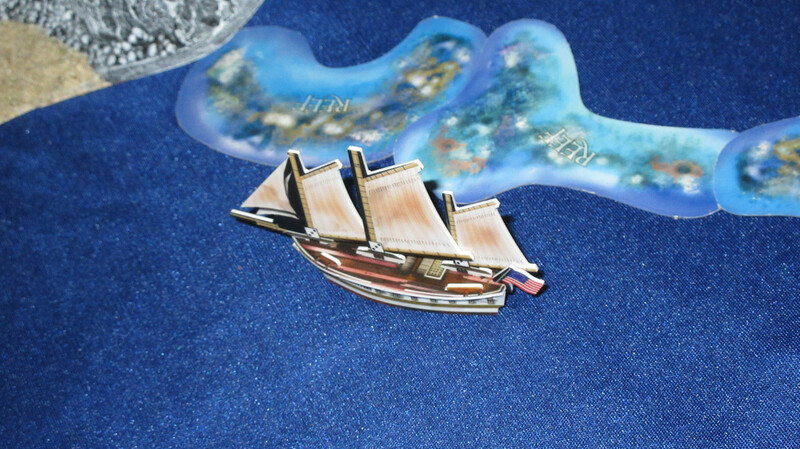 These coins are worth normal value but they give the ship carrying them the Ghost Ship keyword. 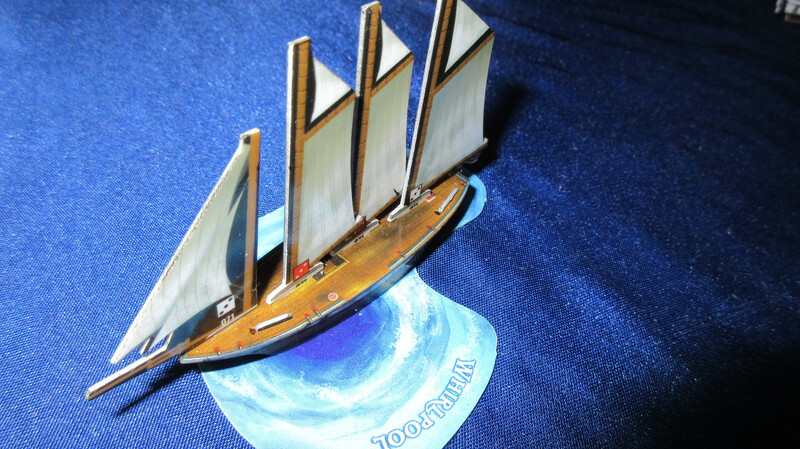 It functions like the regular keyword (as in, it’s optional to use the effect or not), but as soon as the coin is not on the ship, the keyword cannot be used. 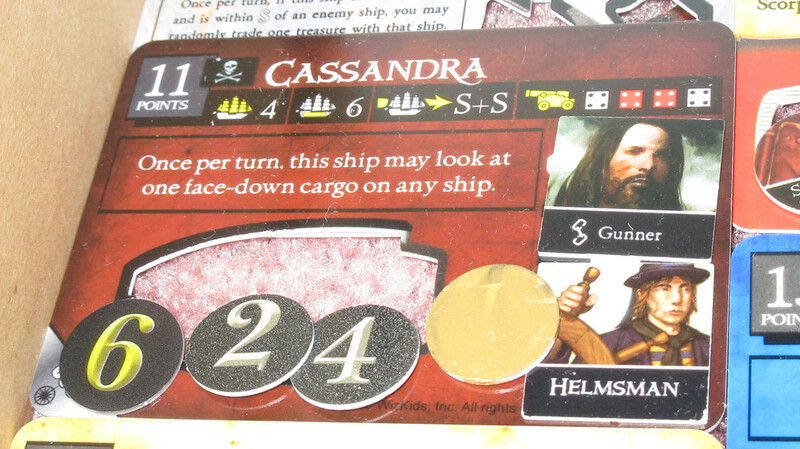 For those of you keeping score, that means that the Cassandra now has 124 points’ worth of gold on board!! 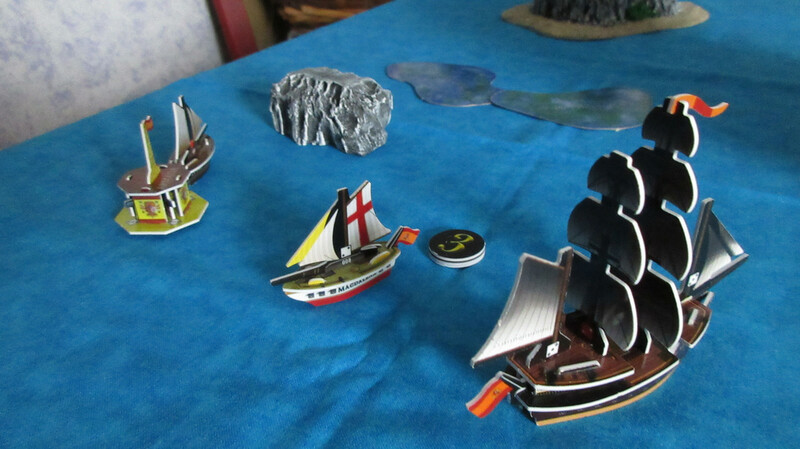 The Pirates leave the kingdom, while the “King” himself (Mission) returns to it. 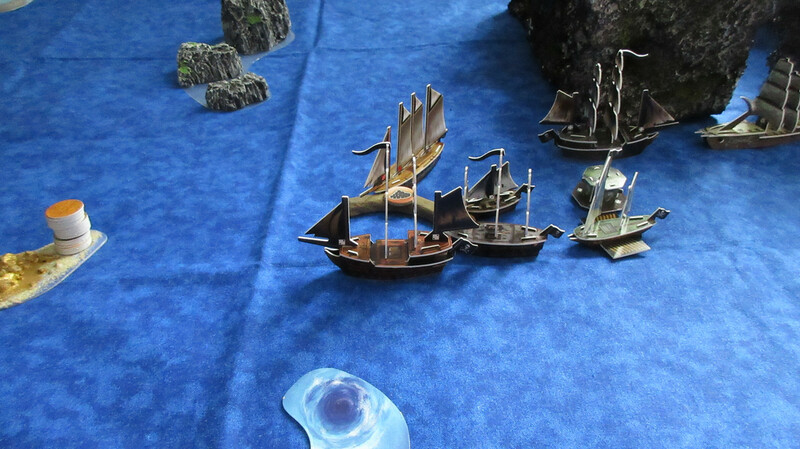 Notice the Golden Medusa had left the Widowmaker flotilla by itself, which turned out to be a mistake since it was getting in the way of logistics. 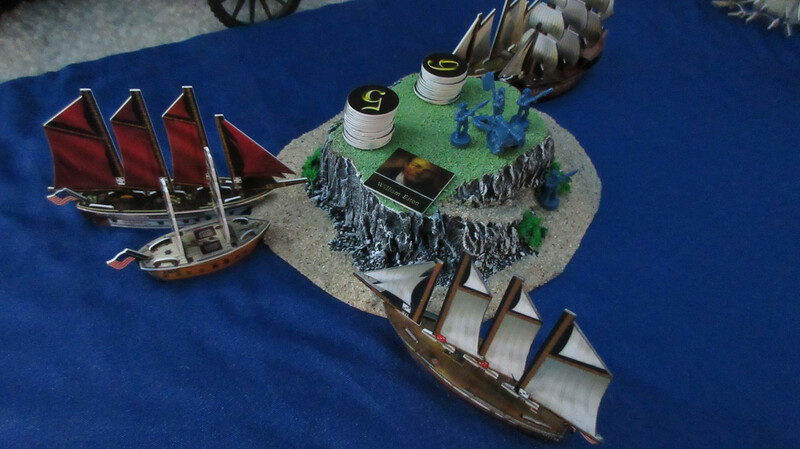 Breaking their own record for this game, the Jade Rebels manage to dock SIX ships at the same resource island on the same turn! 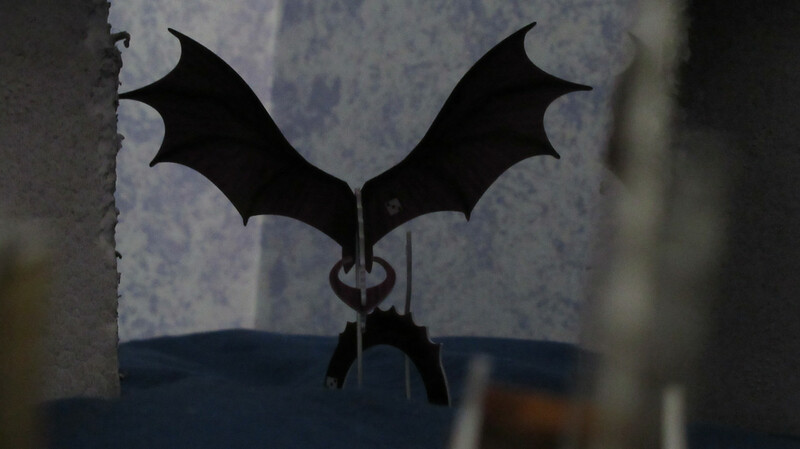 With a hideous shriek and the deep sound of huge beating wings, a giant creature appears before the Jade Rebels!! 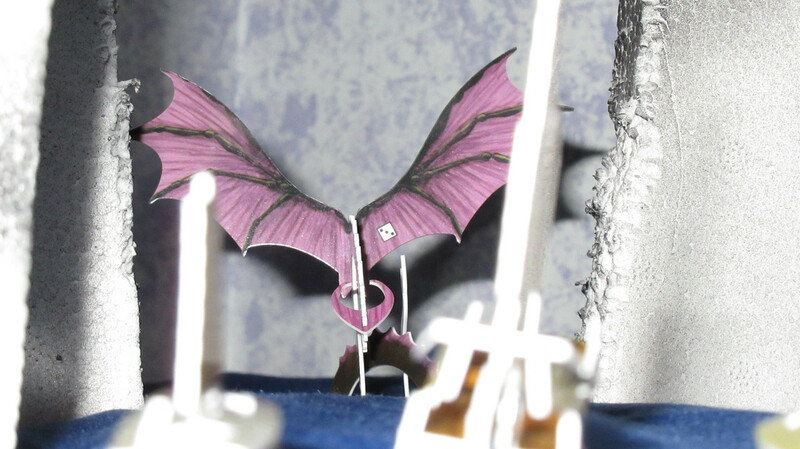 With a huge wingspan that covers the entire width of the “gate”, the creature shocks everyone in the JR squadron. The sun unexpectedly comes out from behind a cloud, and the rebels turn stone-faced with fear. SHAL-BALA IS HERE! Without warning the dragon attacks!! In a sudden charge, Shal-Bala flies at high speed towards the Jade Rebellion squadron! Wings bowl over masts. A huge neck scatters debris and bodies everywhere. 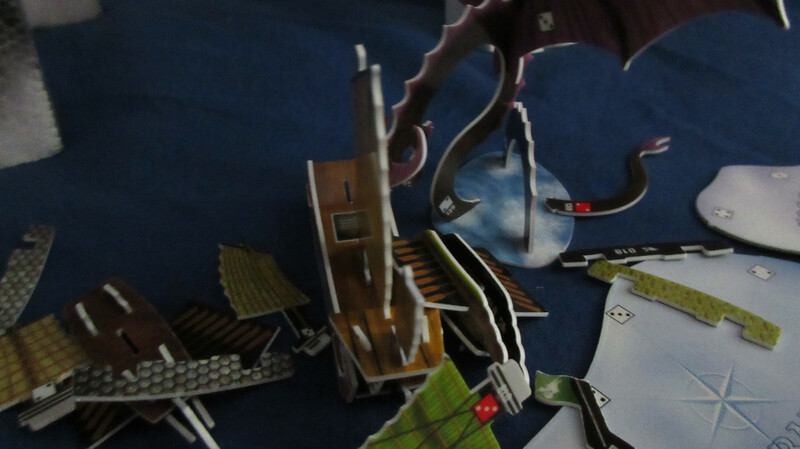 Defensive panels of the turtle ships are crushed when the dragon uses them as a springboard to launch into the air. Here you get a unique view: looking down and backwards as Shal-Bala ascends into the skies. 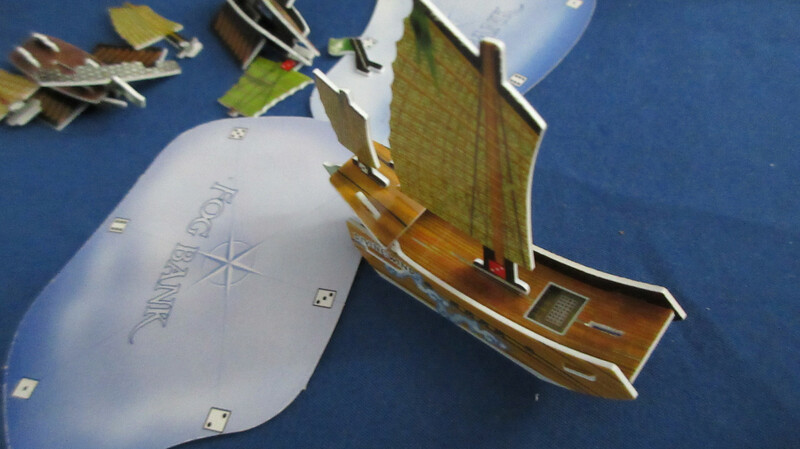 Extreme wreckage is immediately evident: the Hansan Island is dismasted and sinking, while the Admiral Yi is capsized. 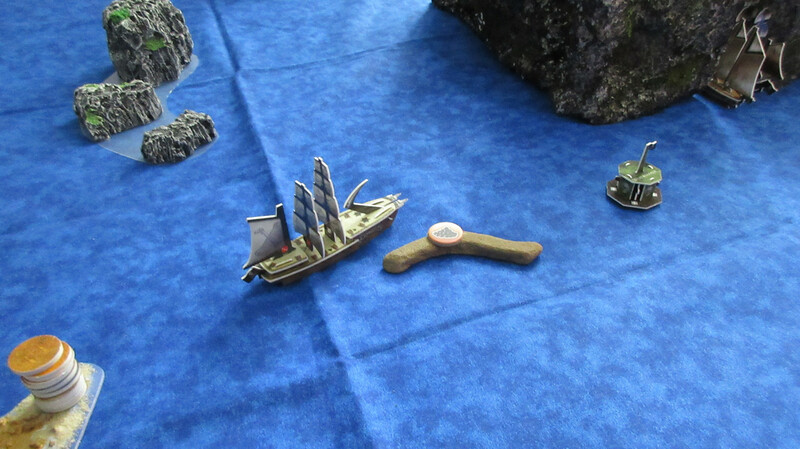 The Divine Wind seems to have survived the attack only due to her size and weight, but she still loses her foremast in the surprise blast attack. Oh my god! No! The dragon isn’t done!! Now swooping back in from the northeast, the dragon returns to finish the job! 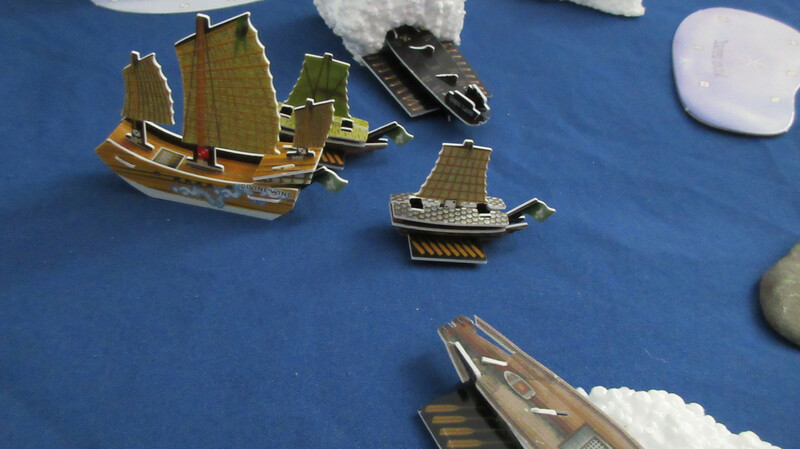 The landing in the water sends more debris flying as the capsized Admiral Yi is displaced to land partially on top of the Divine Wind! 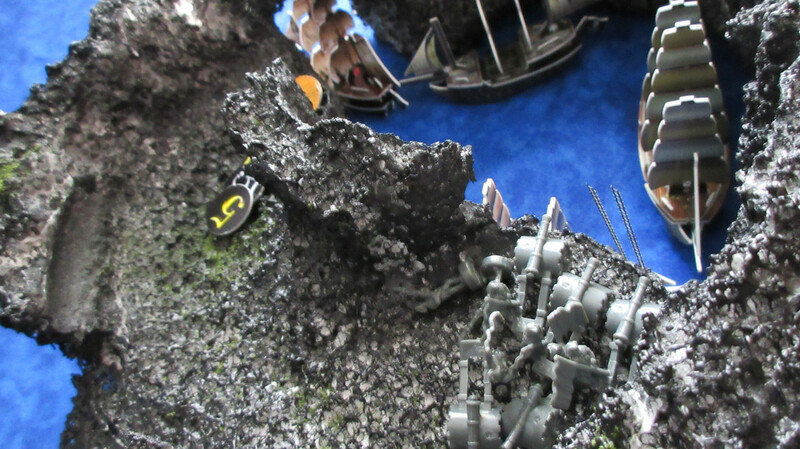 However, though the Jade Rebels never in their most horrid dreams could have expected this, they knew they were going into unknown territory which may have taken the Sea Serpent earlier! As a result, the guns were preloaded in the case of any emergencies! 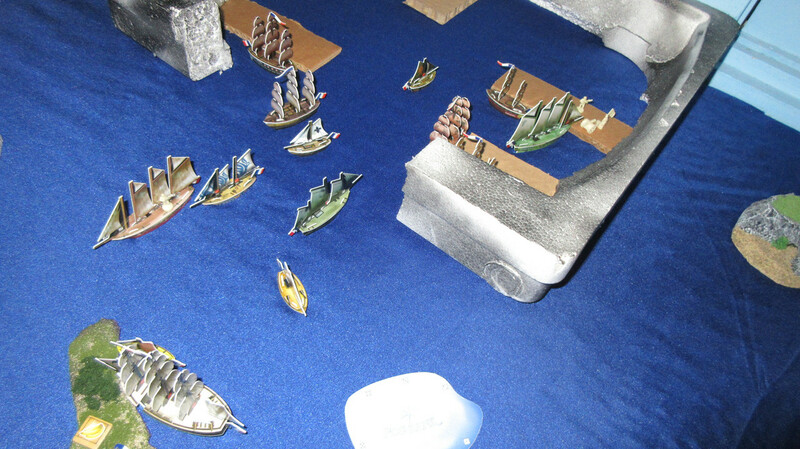 A few gunners lived to fire off a few shots on the starboard side! 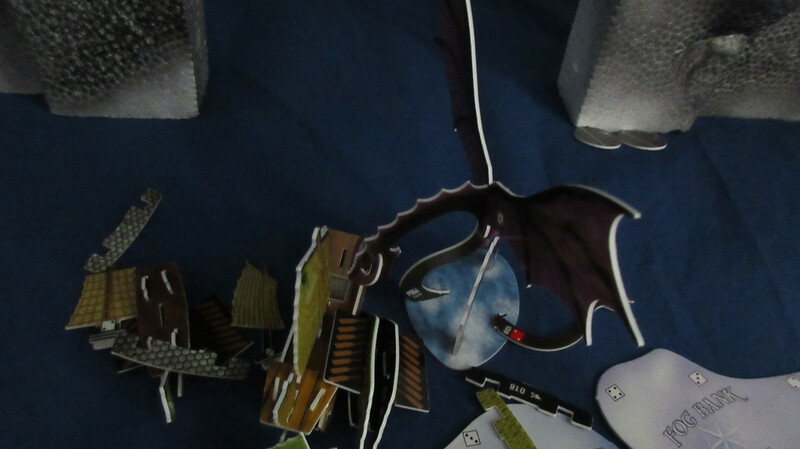 Hissing and shrieking, the dragon has its tail shot off!! 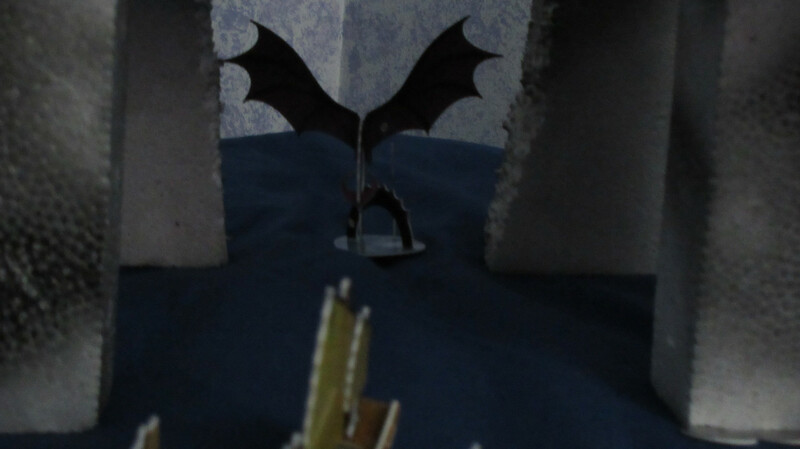 This prompts a quick escape, as the dragon immediately ascends into the gloom, leaving the few survivors of the Divine Wind paranoid that another attack will come soon. Well then. Enough of the Sea of Allost for one day, eh? 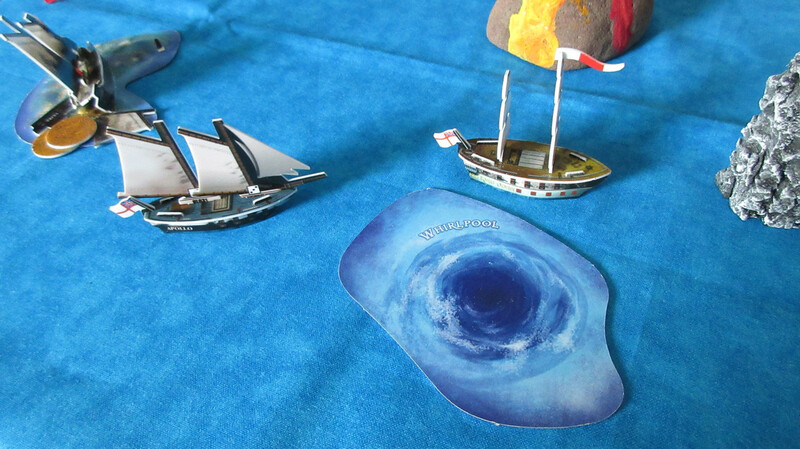 Back in Caribbean waters, the English launch HMS London for patrol duty and grab the Starbuck as another resource runner. Completely predictable by now, but considerable English operations are once again underway at Diamond Rock. Gunn is going to try his next strategy. Completely in the shadow of Diamond Rock, the Aguila loads resources for the first time. Capitan Raphael Vospero has taken a vow to avenge his brother, whose ship was sunk by HMS Viceroy. Vospero uses his access to naval intelligence reports to mask his quest as service to the Crown. Vospero not only hates the English, but has a personal issue with the Viceroy as well! … two of France’s finest! Two of my favorites as well. 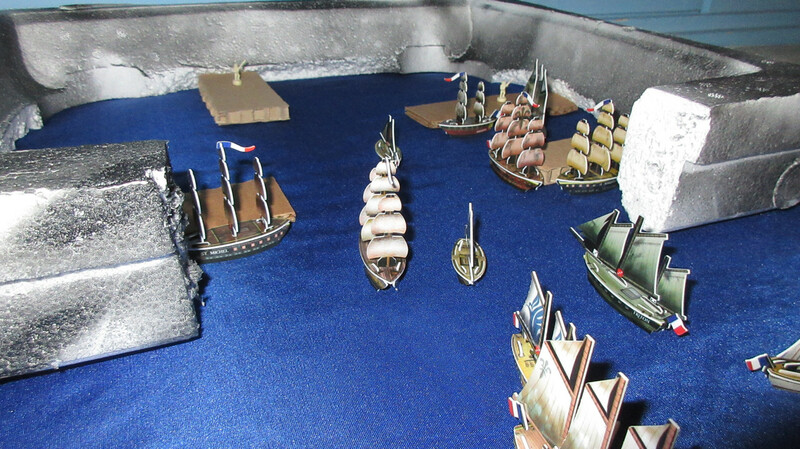 The Dauphin Royal is crewed to her point capacity, with Monsieur Lenoir, Phillipe Amqui, a captain, a helmsman, and an oarsman all coming aboard. She is tasked with one job: explore new territory! The French know their food won’t be immensely valuable forever, and indeed another resource change is coming soon. They need to have other resources available in the future, and so the French are finally looking to expand beyond their main wild island if they can find other islands. Joining her on the expedition is La Dijon, a good gold runner from the Frozen North. 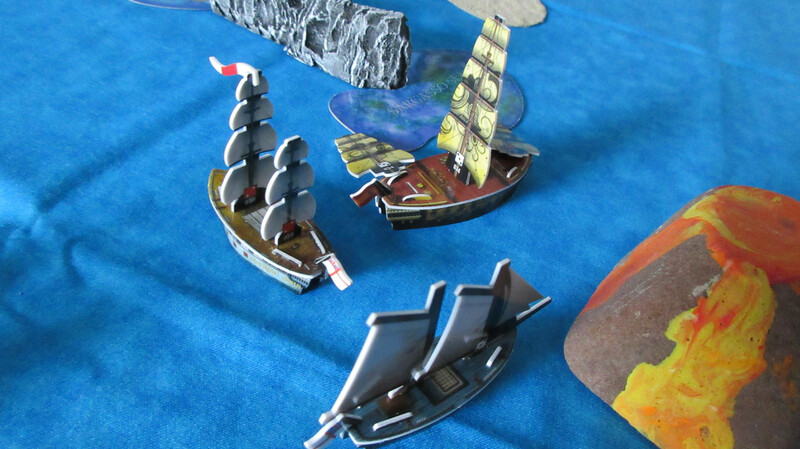 Her crew are eager to help the Royal find new lands, and the Dijon provides the cargo capacity to show off any new findings when she returns home. 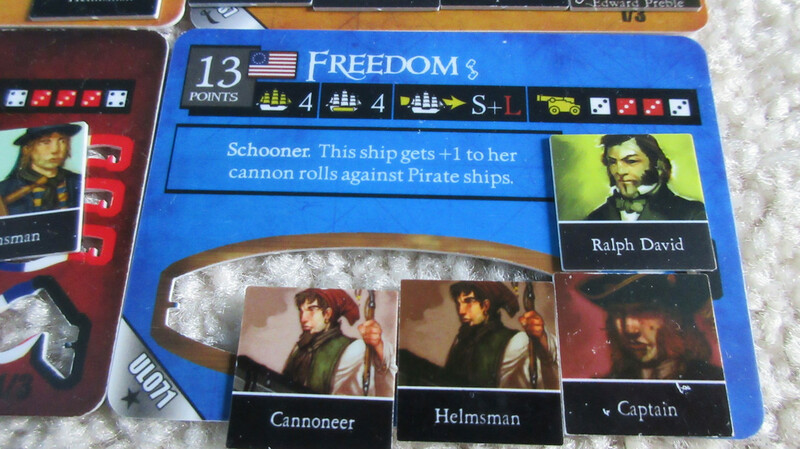 Ralph David is so angry and ready to kill Pirates that he steers the Freedom directly into the whirlpool south of the American home island!! What could happen next?! So, I will be using some special whirlpool rules in this game. 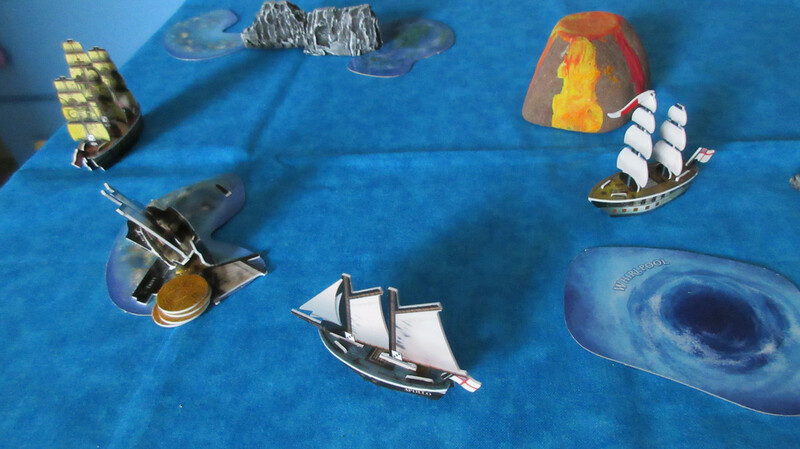 As you know or have deduced by now, the factions playing don’t know who else is out there on the seas with them. They are discovering things just as you are. 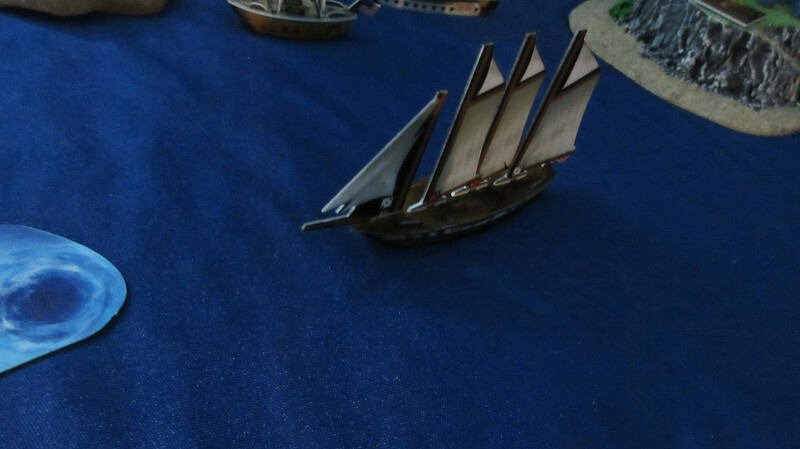 In fact, the English and the Spanish are the only factions who know about each other, though the Jade Rebels now know that a sea dragon is also out there, somewhere. In addition, the factions don’t really know where they’re going when they travel, hence the need to explore to find things. As there are 3 oceans in this game, there needs to be a way to travel between oceans or I’d be essentially playing 3 separate games. However, who said whirlpool travel was remotely safe or predictable?? The factions not only aren’t aware of how many other oceans there are, but they also don’t know anything about them or where they are in the world. Assign numbers to the different whirlpools across all oceans. 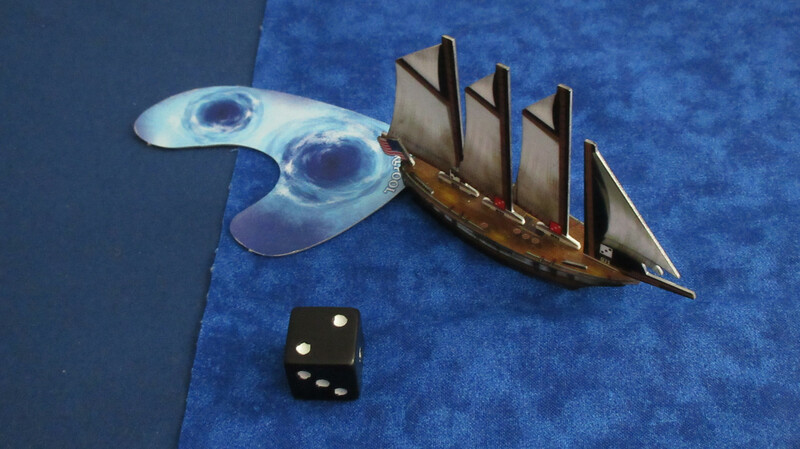 When a ship enters a whirlpool, roll a d6. The number is the whirlpool the ship exits from. Once a ship has rolled for the whirlpool, roll another d6 to determine which direction the ship will be facing when she emerges. This follows the compass rose: 1-N,2-NE,3-SE,4-S,5-SW,6-NW. When a faction has used a whirlpool to travel to a new location, they can then travel to that location from that same whirlpool. Aww come on! 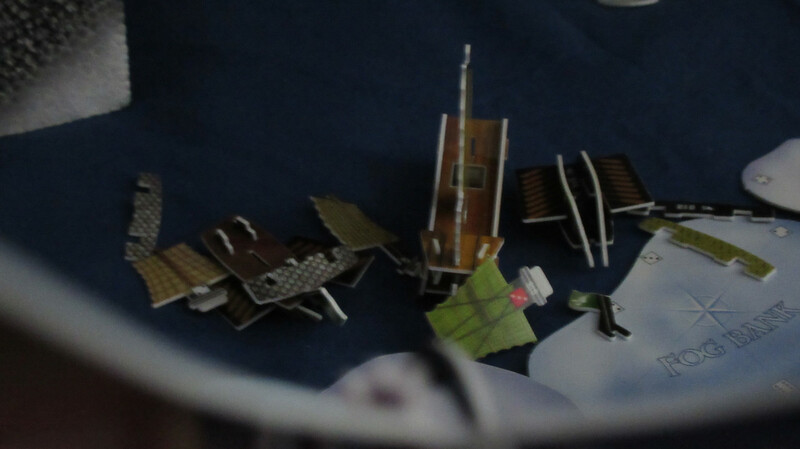 XD The Argo and Colonial Trader dock at Luck Island, but the spices are gone! The Americans have already drained two islands of their resources, but still have food up north. 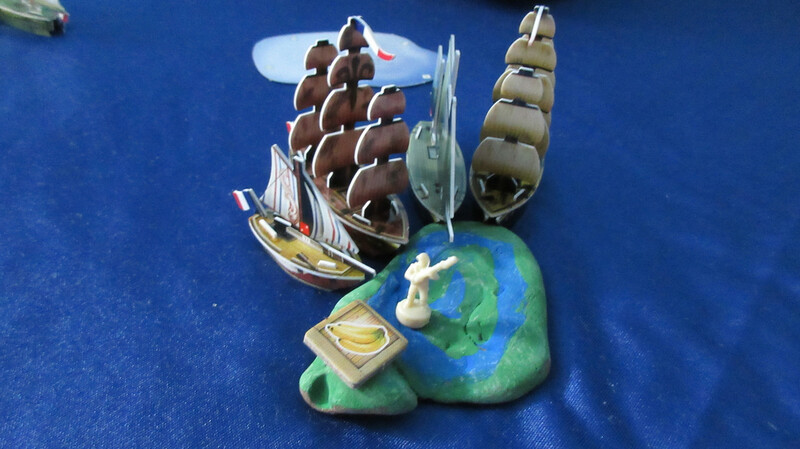 The food is still viable, and the Americans have marked their beaches with infantry troops. The Bonhomme Richard has a new task: go farther north around the big island and see what is on the other side. 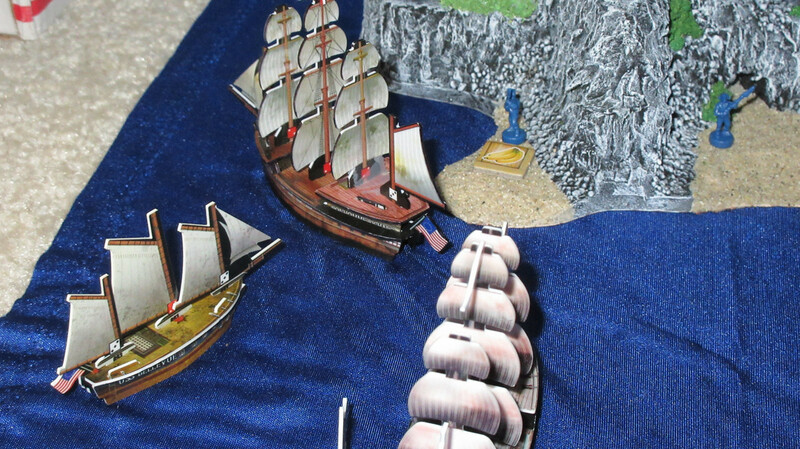 The crew of the Wasp inform Commodore Preble about the shortage of luxuries on Ruby Island. 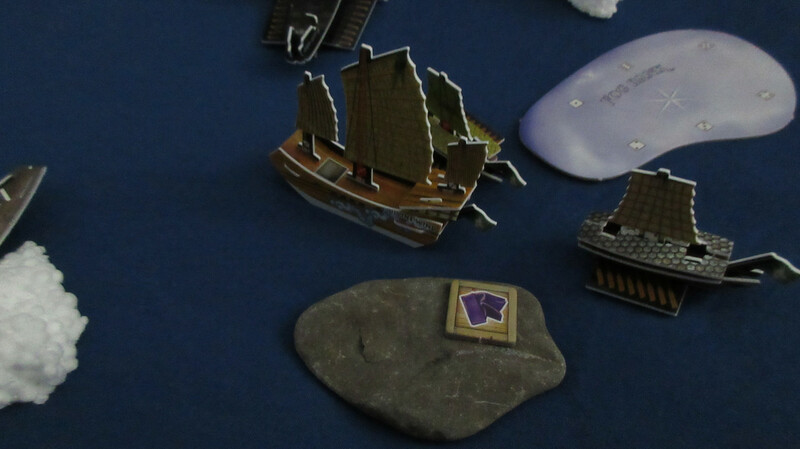 In the background, 4 canoes and the Louisiana have docked home 12 food tokens for a quick 72 gold payout! This lets the Americans launch the Congress with some interesting stuff aboard, along with the Concord and Delaware with captains and helmsmen. A rare but cool shot of the northern arch and crags of Mission’s Kingdom. You can see the glitter on the Doombox. Leaving a scene of death and carnage behind, the Divine Wind turns around and heads back into the fog. Seems like a wise decision, no? A confused and soggy Ralph David asks the crew of the King John if they’ve seen any Pirates in the area. 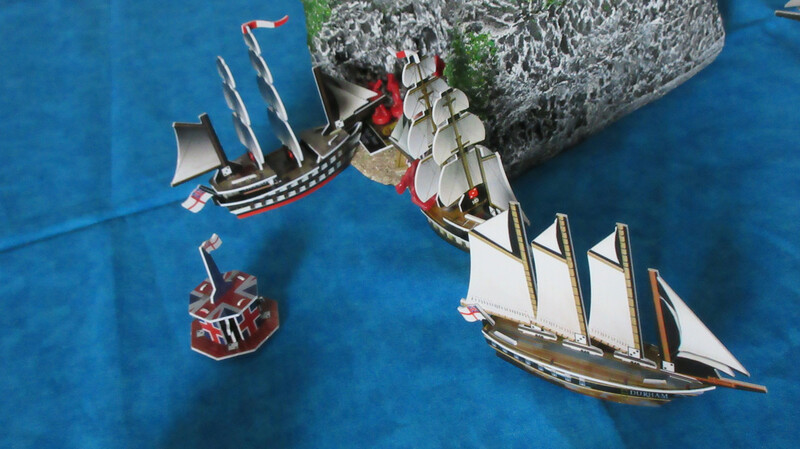 The English respond with a truthful no, and appear shocked that a ship could emerge unharmed from below the swirling water. It was a very brief exchange, as David seemed to be in a rush. 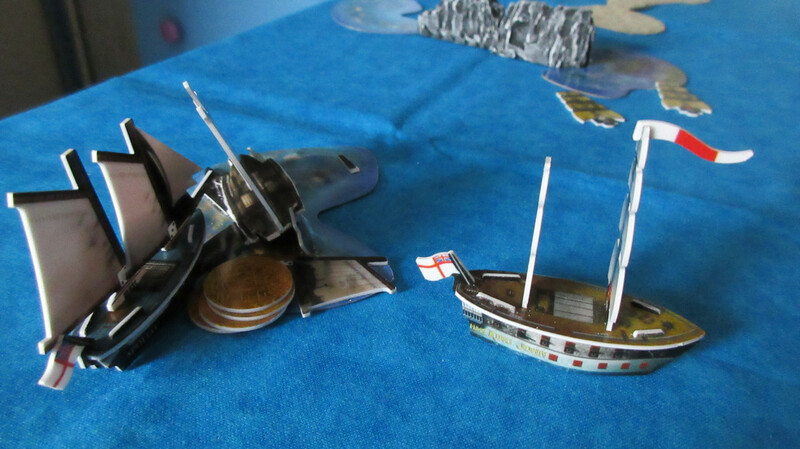 The English would normally have considered attacking, but the ship appeared so suddenly that the weren’t ready. In addition, the Freedom is much larger than the King John, and the Americans didn’t seem unfriendly. 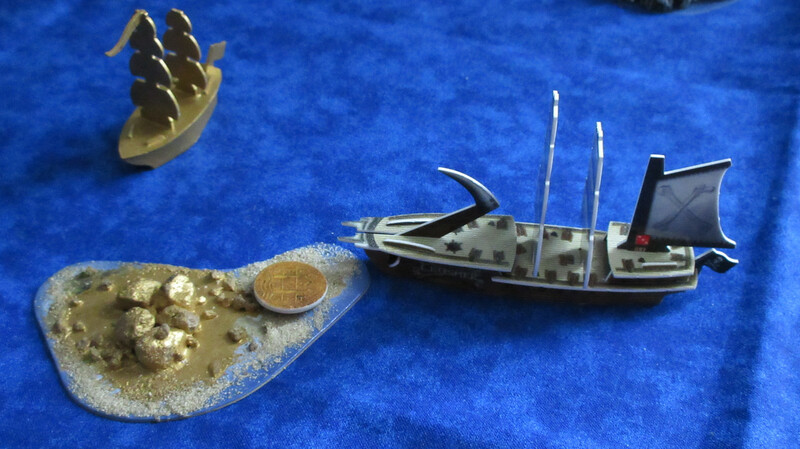 The coins at the lower left are loaded by the Apollo from the Duke shipwreck. 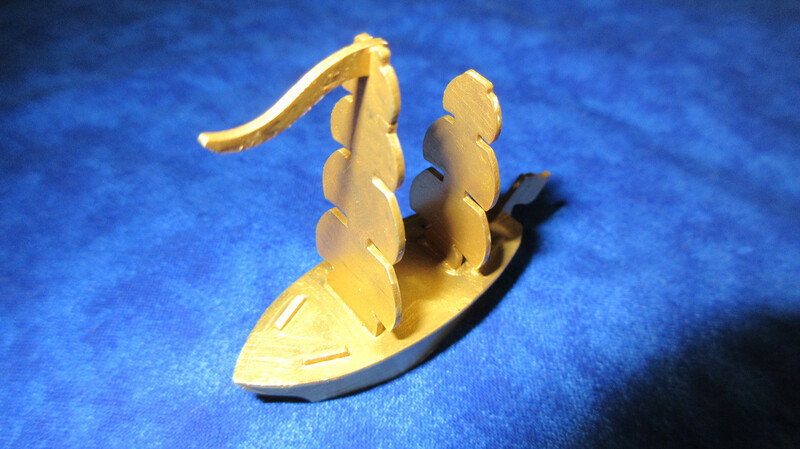 The English crew aboard the Apollo are somewhat disappointed by the rest of the gold, and are suspicious that the San Estaban may have been carrying something of great value that they found first…. 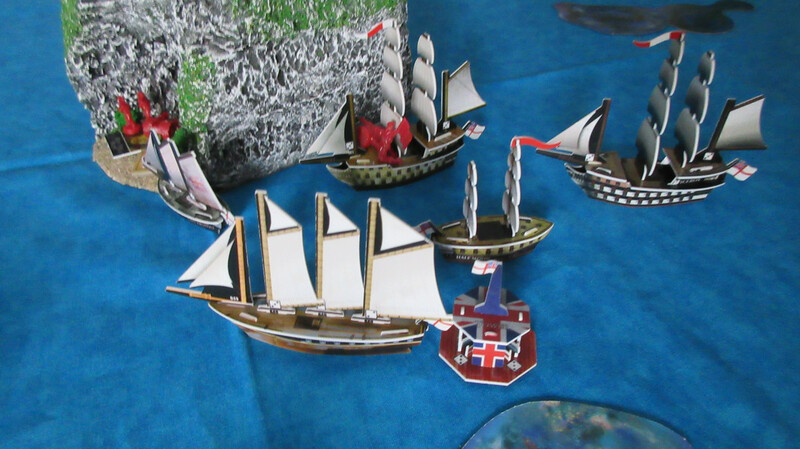 The Durham leaves the Tower flotilla to further improve the defenses around Diamond Rock, which are starting to look like overkill with almost no other ships even close in the area. The Burma docks at the beach where Gunn is carrying out operations. 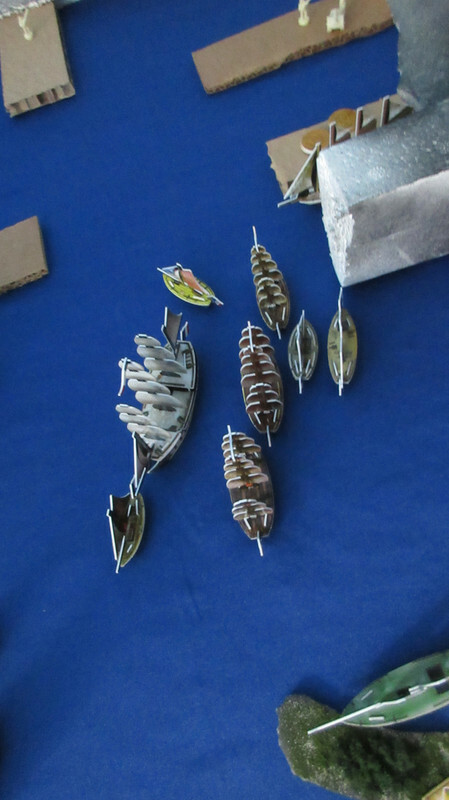 His crew disembark with supplies, and begin work on the project. 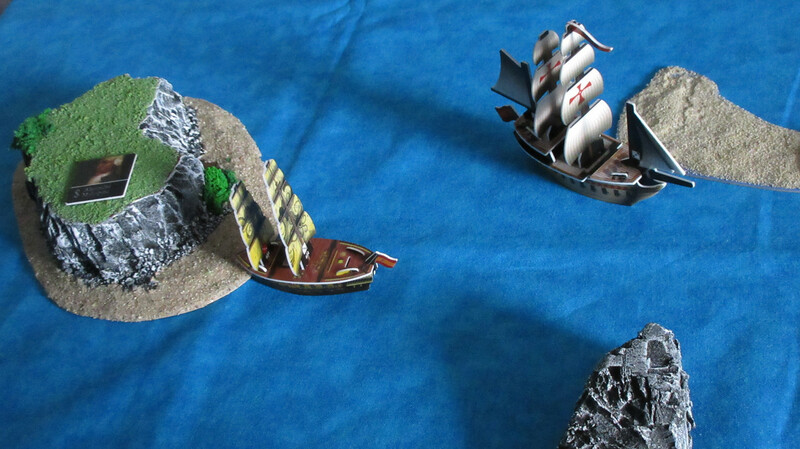 The Matthias Vospero sets sail for the English, and the captain of the San Estaban promises to be right behind as soon as he finishes repairing the ship. 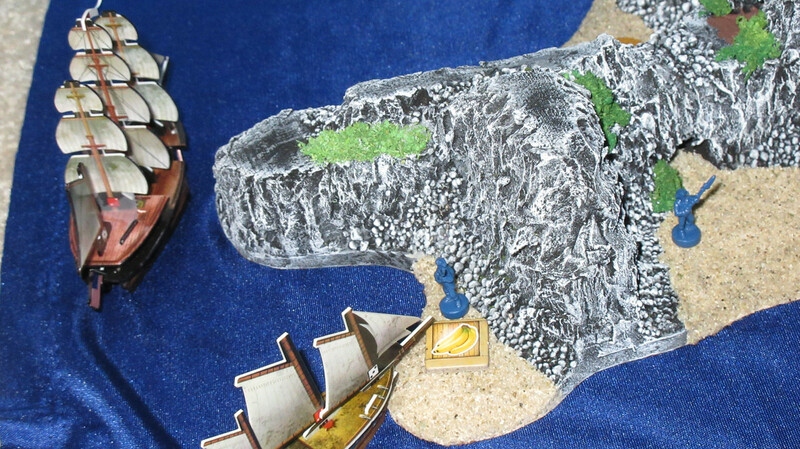 Commodore Preble inspects Ruby Island and is not surprised that it ran out of valuable resources due to its small size. 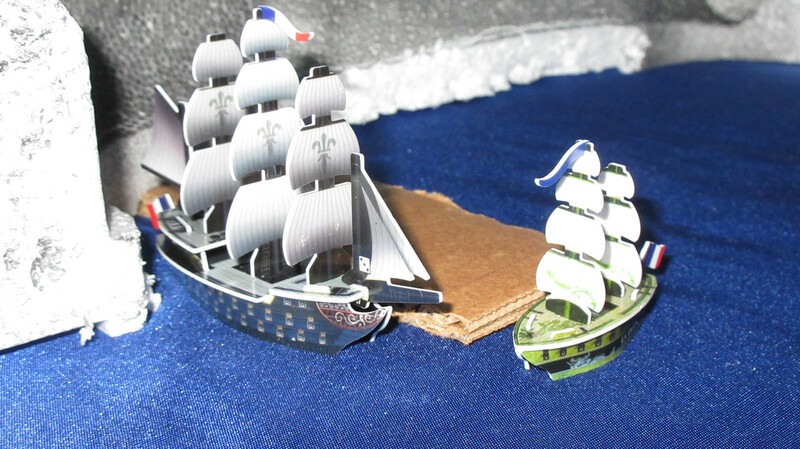 The newly launched Concord and Delaware join him, curious but quickly getting bored by the lack of combat in the area. 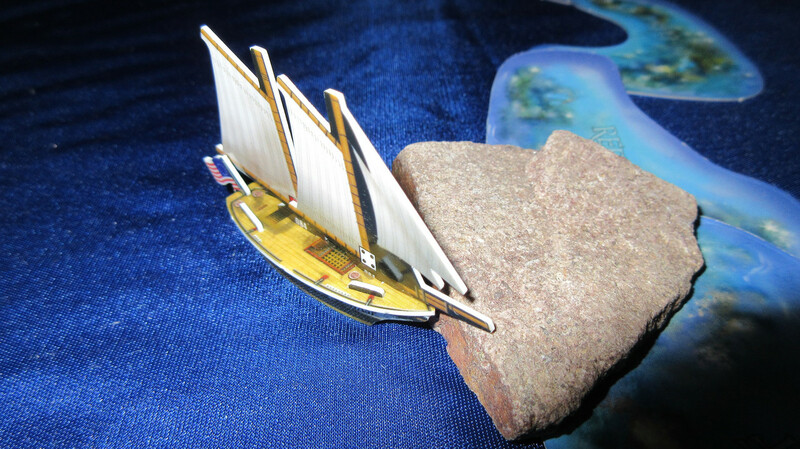 “We’ve got to get moving” remarks Ralph David, and suddenly the American schooner disappears into the Caribbean whirlpool! 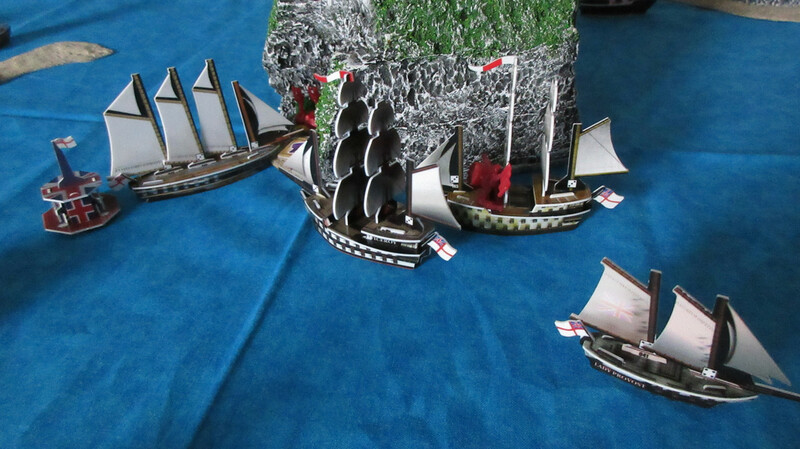 The English are a bit puzzled by the quick and odd encounter, but agree that pirates are a bad thing that need eliminating. With that, the Freedom goes back to whirling around! This time she rolls a 2, and ends up in an undiclosed location. Last turn of the day! 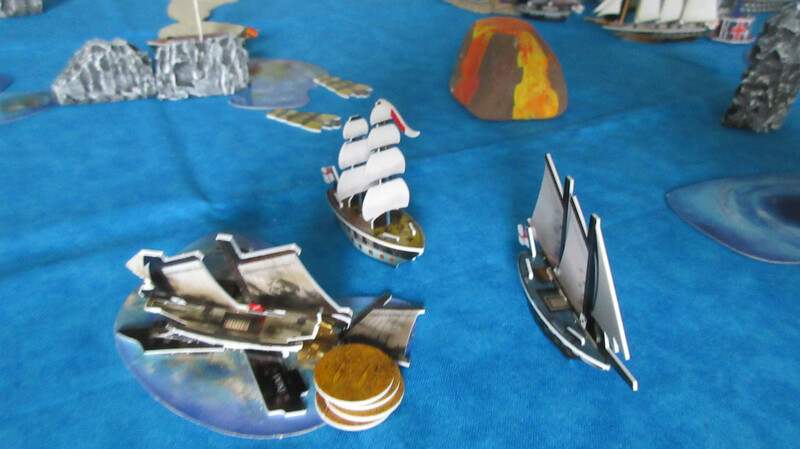 The Cassandra returns home and the Pirates spend a new in-game (meaning for this game) record of 132 gold in one turn, adding 8 to the 124 the Cassandra unloaded. 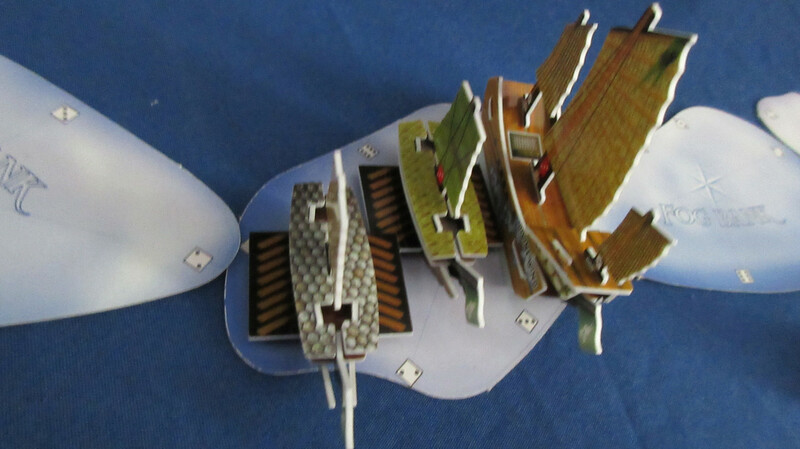 This fetches them a whole new fleet, which mostly consists of large hybrid ships. O_O Oh boy! Look who’s here: BLACK BART! 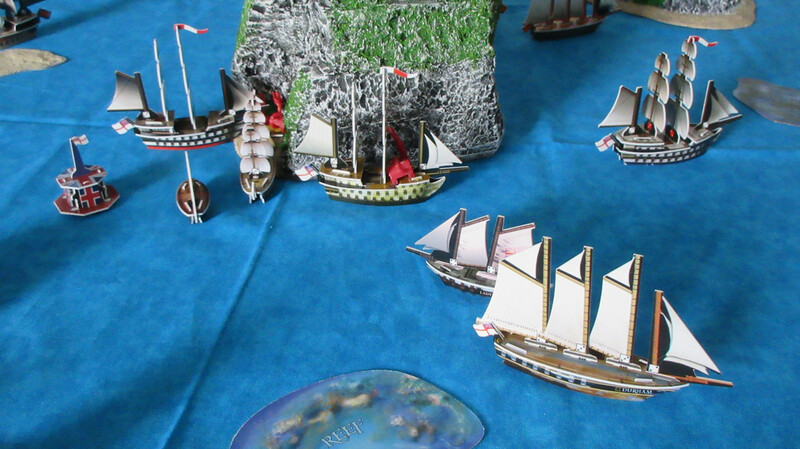 Bartholomew Roberts enters the game aboard his ship, the Royal Rover. 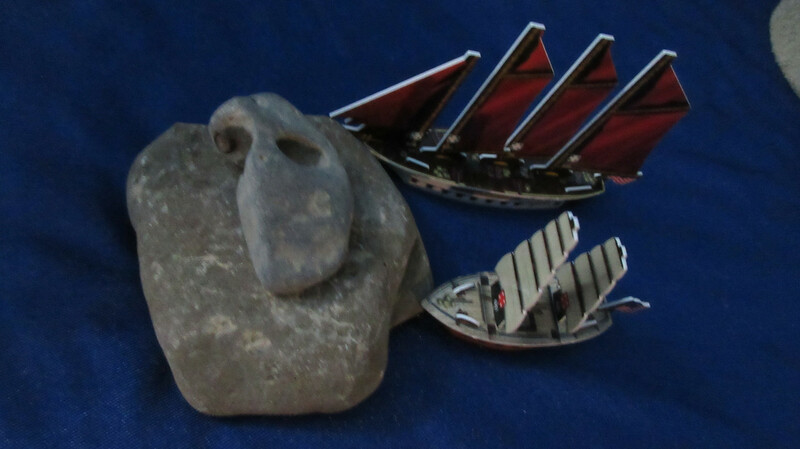 Off the starboard side of that ship is the Cutlass, a swift and accurate Pirate schooner. The Fool’s Gold departs the northern entrance, and you can see that the Eagle is one of the new additions. An awesome closeup of the interior of Mission’s Kingdom! 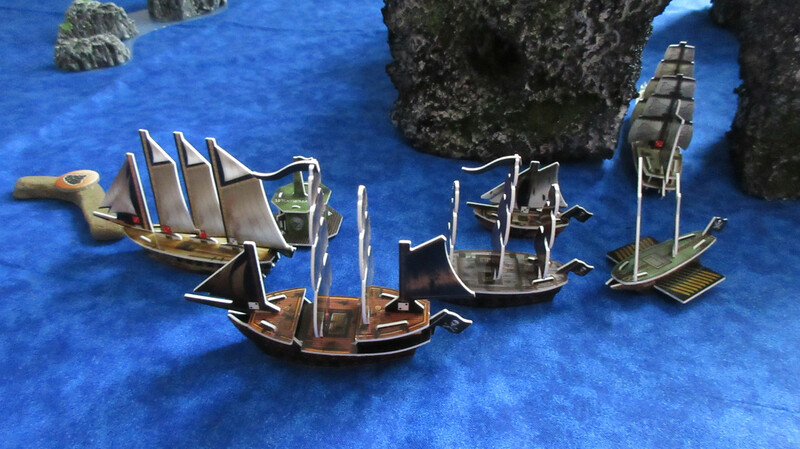 The Queen of Cups is introduced, but perhaps more interesting, the Pirates have purchased some ladders! 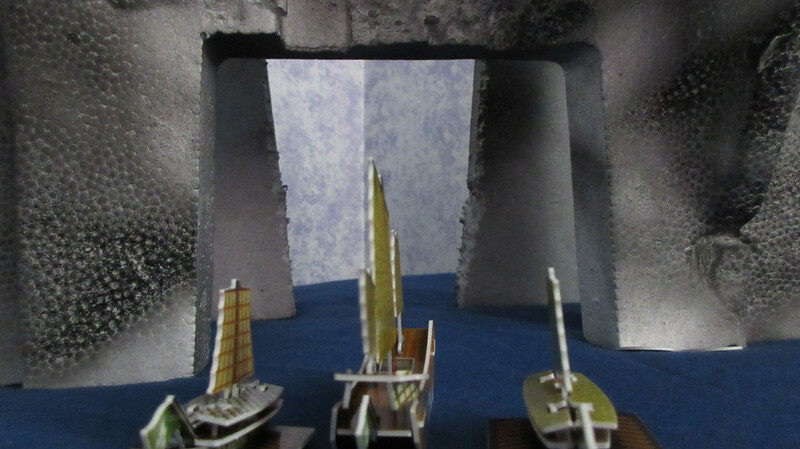 Notice how the walls are hollowed out near the waterline, allowing for smaller ships to hide deep in the bowels of the kingdom. 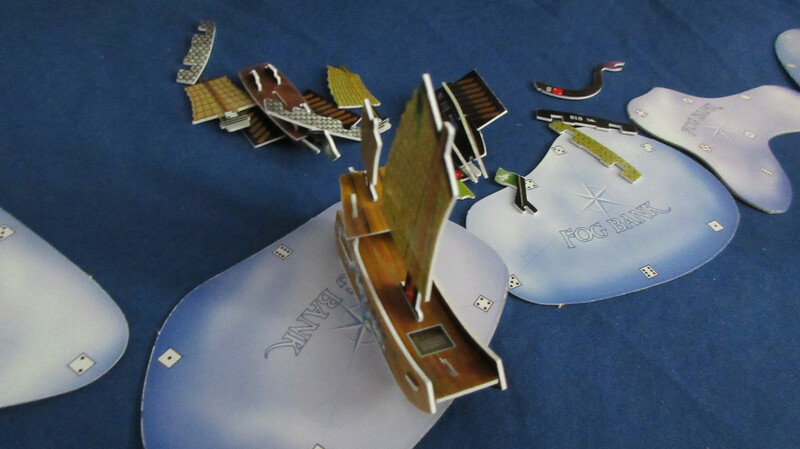 Along with the new Grand Barnacle, you can see why the Pirates needed some ladders – they are transporting some major equipment to the flat upper part of the kingdom! 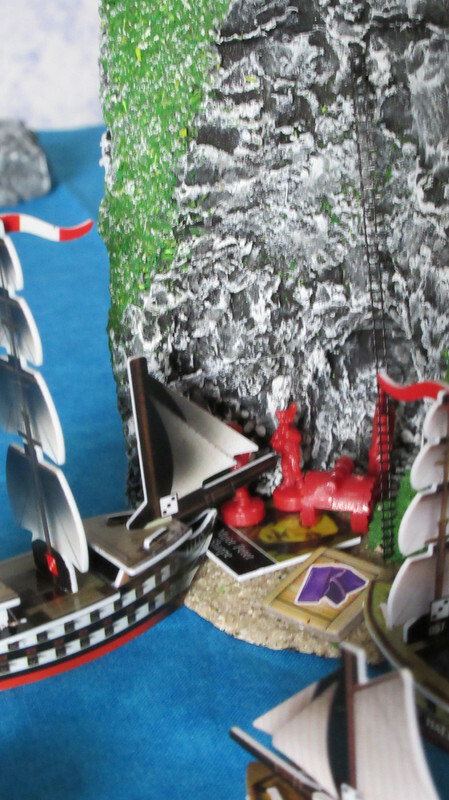 Mission’s Pirate Kingdom operations are in full swing, but what does this mean for the future?? Check out that brand new artillery cannon which was raised to the top. 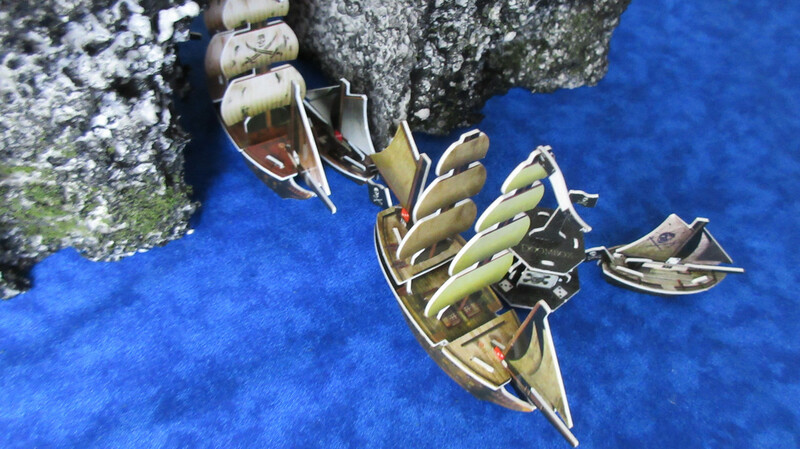 I’m absolutely loving these ladders, and these closeup shots really show how cool they look and how good the scale is!! 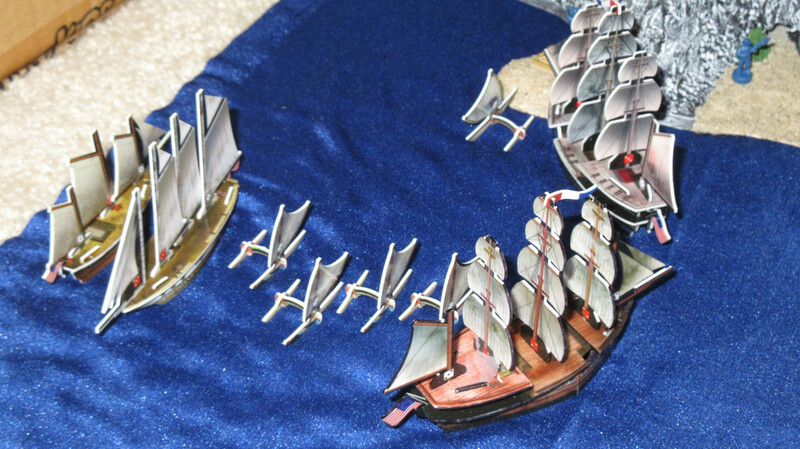 The Pirates purchased 3 1L lengths of ladder along with no less than 4 artillery units. Clearly they have plans to optimize and fortify the kingdom, but operations are only just beginning. Oh! 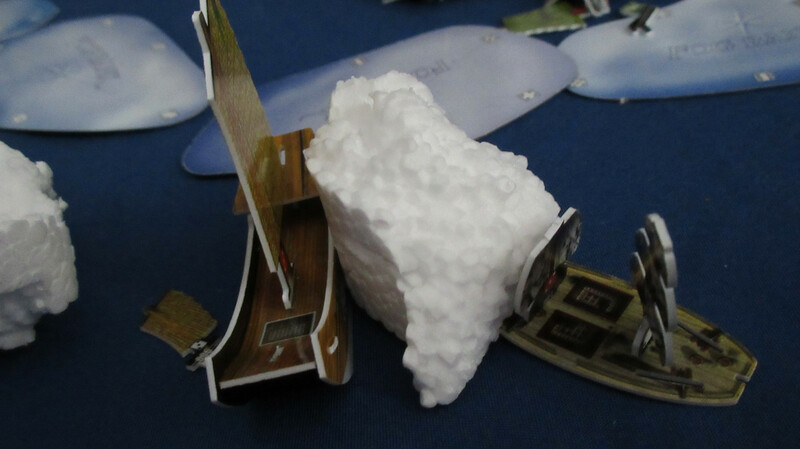 But as soon as the ship resumes her course home, she is slammed on her larboard quarter by another icewreck!! 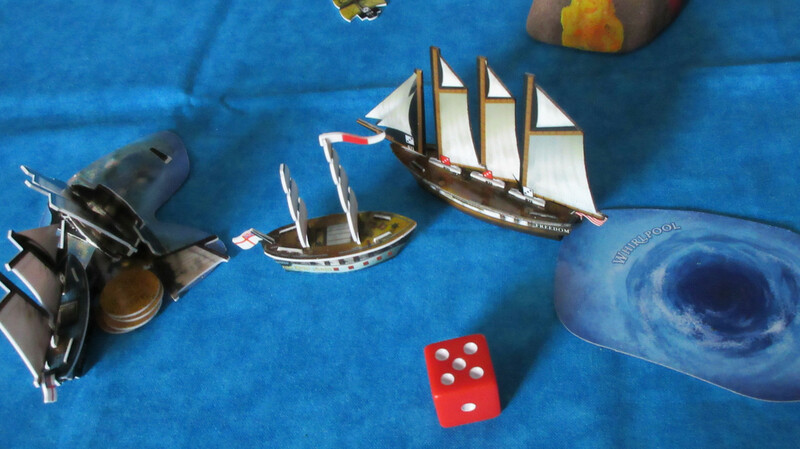 The loud collision breaks off her foremast, and leaves the ship slightly off course and unable to complete her move action. How strange! Gunn isn’t surprised that the ladder can’t reach the summit, but he is happy with the progress thus far. In addition, we know he’s got a bigger ladder with a length of 2L! However, it may take some time to get it properly installed and safe for use. 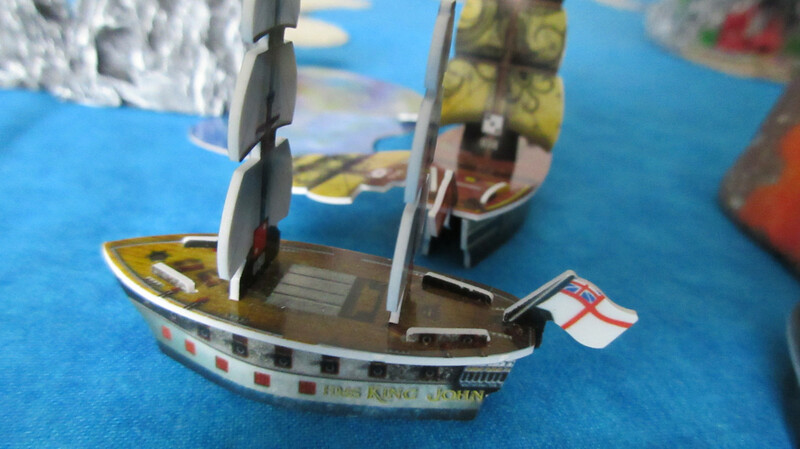 The Apollo sets sail for the long journey home, while the King John guards her against any incoming whirlpool shenanigans and even the Spanish if they happen to appear. 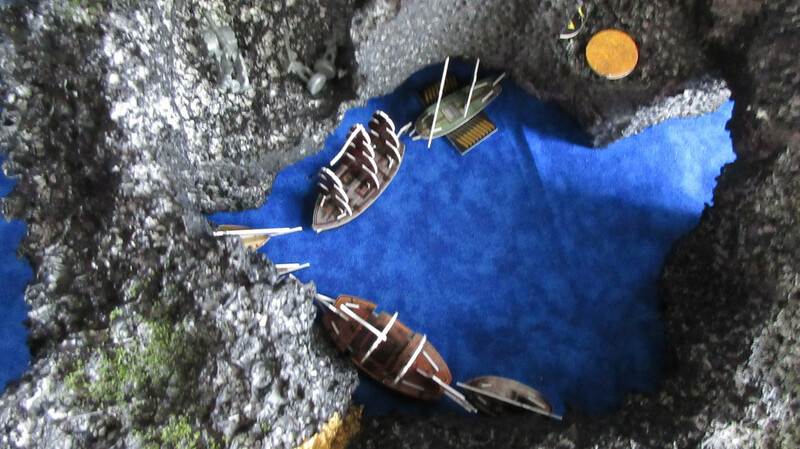 The Burma gets out of the way so the resource gatherers can dock, but her crew are getting annoyed with how long the operations are taking at Diamond Rock. 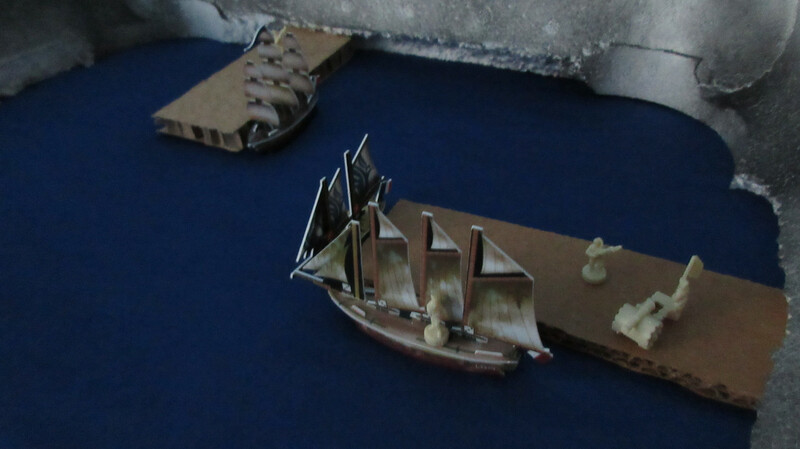 The crew of the London aren’t bored yet since they are fresh hires, but that ship is simply on patrol duty to the north for now. Well that didn’t take long! The Dauphin Royal finds a new island! The French cash in food but decide not to launch for once, somewhat satisfied with their resource fleet. The Minuteman passes by the Congress, who has a mission that is almost ready to be carried out! 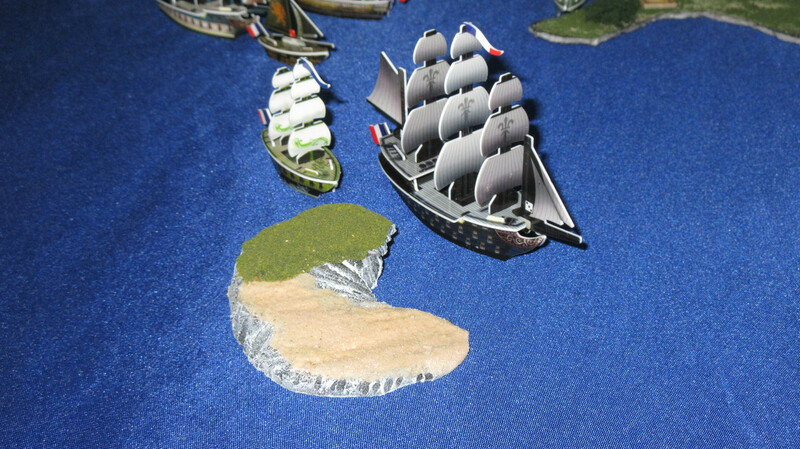 The Bonhomme Richard finds a beach on the northern side of the big island! And that is that! I understand there were a number of cliffhangers in this report, but as I said in the introductory post, all will be revealed in time. You are seeing things as the factions see them, which I think is fun and keeps the suspense up. Today saw a lot of launchings, some interesting new discoveries, a mysterious gold ship, the appearance of a dangerous dragon, and weird whirlpool adventures. And of course, the first shots were fired! Stay tuned to find out what happens next! 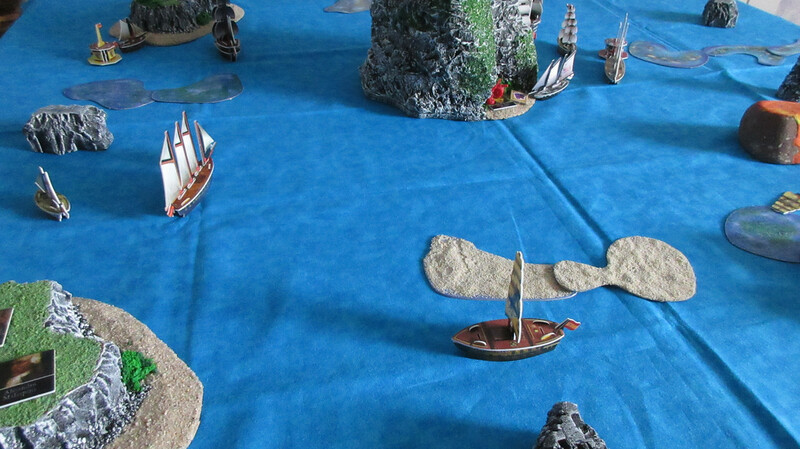 Posted in Battle Reports and tagged Battle Reports, Command the Oceans, Games, Huge Games.